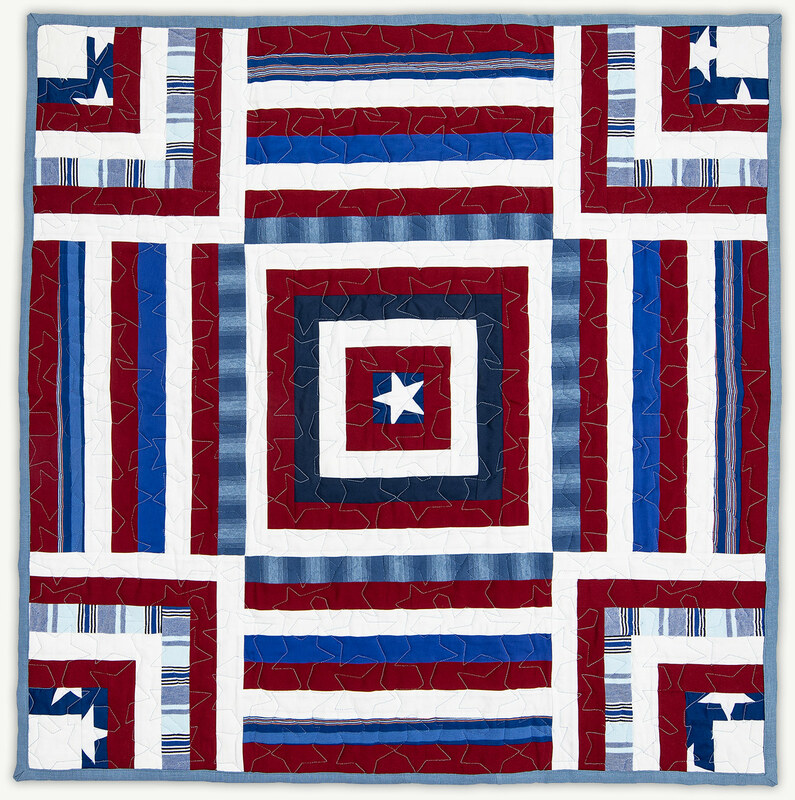 Feel a sense of connection and comfort by honoring someone special with a memorial quilt. 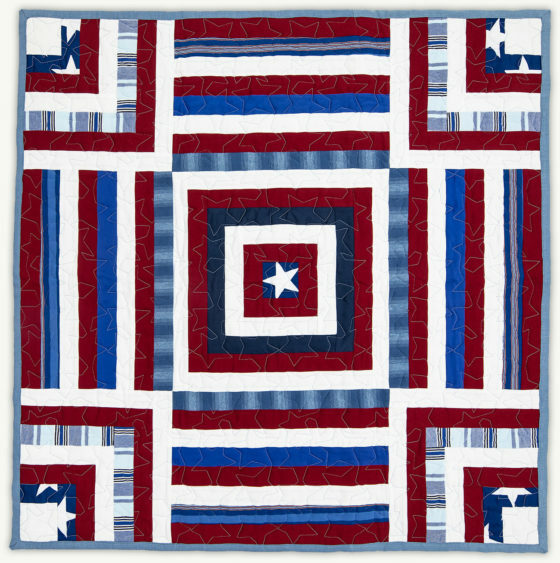 Made with clothing and keepsake fabric supplied by you, we work together to create a meaningful object of remembrance. A Memorial Quilt honors the life of someone special and is made from his/her clothing or other keepsake fabrics. Do you work with clients long-distance? 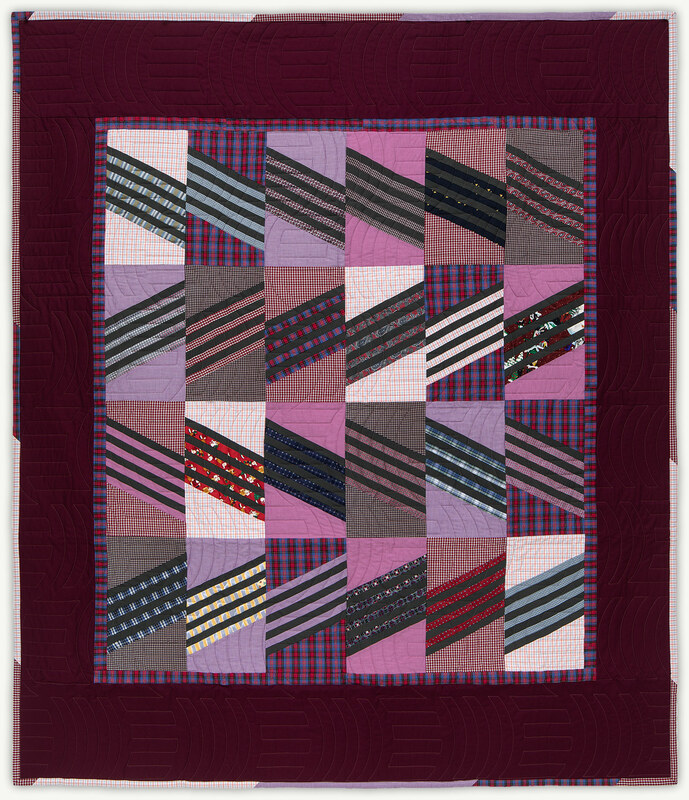 Which types of fabrics can and can't you use in your Memorial Quilts? I have found t-shirt fabric and other stretch knits to be problematic; the integrity of the pattern is difficult to maintain, so I avoid those. 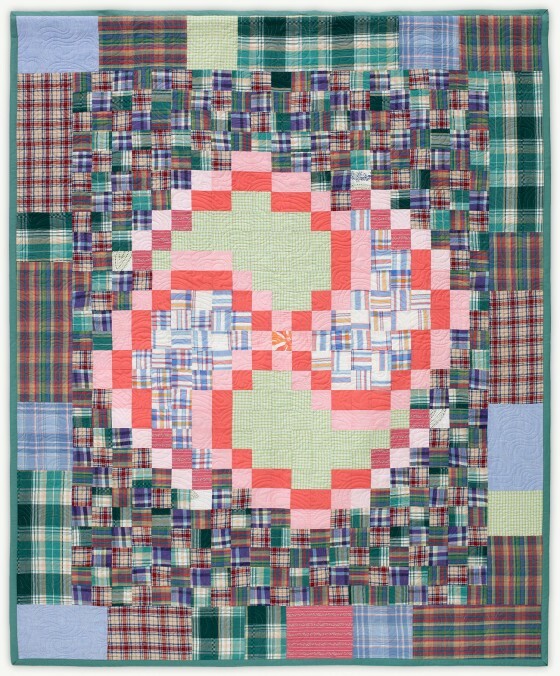 Otherwise, it really depends on the end use of the quilt. 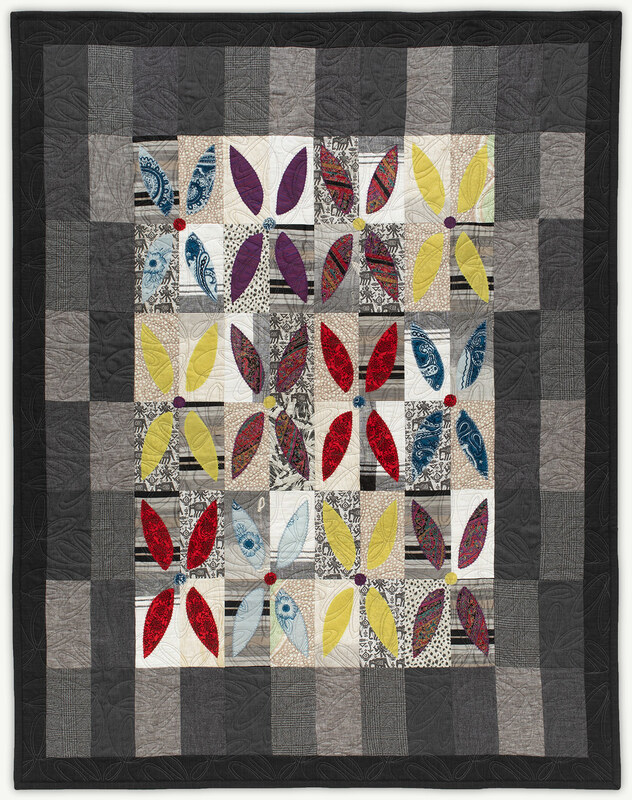 Wall hangings are more forgiving when combining different types of fabrics like thin silks, rayon, etc. Functional bed quilts do better with stable fabrics like cotton, linen, and lightweight wool. Do I have to supply all of the material for a Memorial Quilt? No. 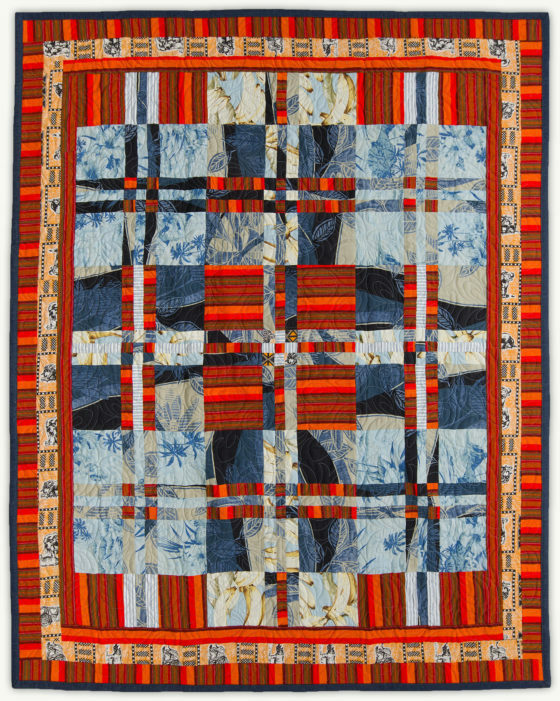 Many of my quilts have been a blend of fabrics that I have received from clients and fabrics that I have in stock or have purchased to enhance specific design elements. Sometimes there’s not enough clothing material submitted to piece together a border for a larger quilt, so I might propose using one of my linens or wools to frame the pieced body of the quilt. How do I prepare the fabrics/clothing I send to you? I ask that ALL fabric, especially clothing, be washed before you send it. This may include dry-cleaning certain fabrics according to their care instructions. 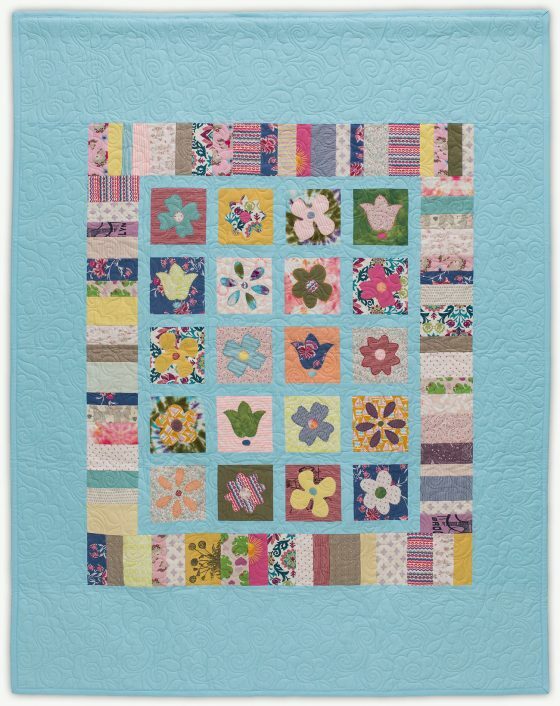 How do I choose a quilt pattern? 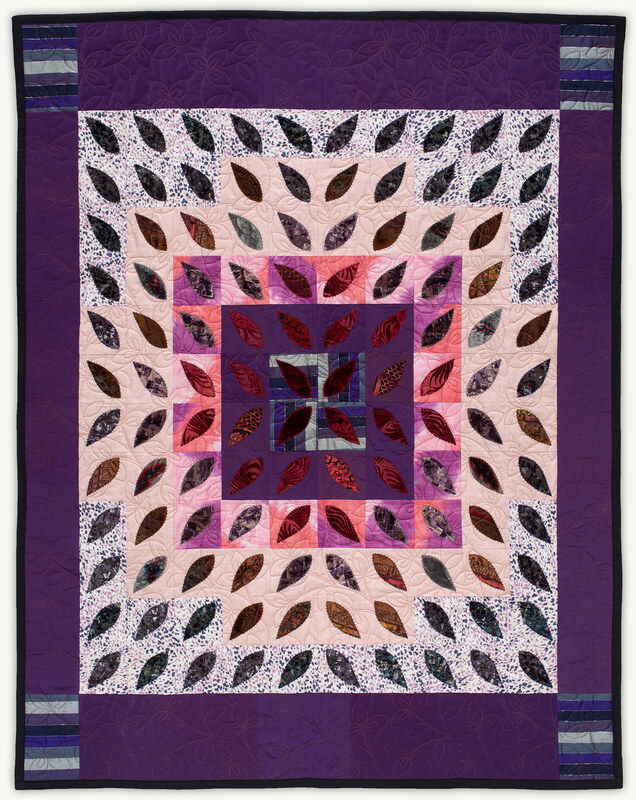 You may choose from any pattern you see in the Memorial Quilt Gallery, or you may work with me on a custom pattern. Likewise, if there is a pattern you like anywhere else on my website, we can discuss its viability. It is important to note that the same quilt pattern looks completely different from quilt to quilt based on the highly individualized groups of fabrics each person supplies. 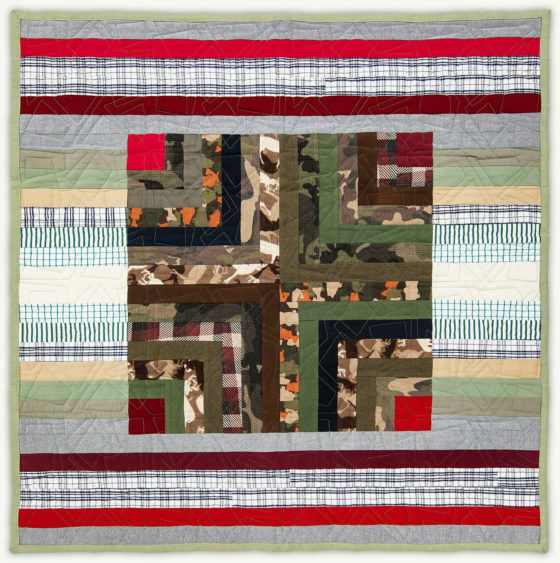 Is it possible to get a Memorial Quilt made from a pattern in one of your other quilt sections? Absolutely. 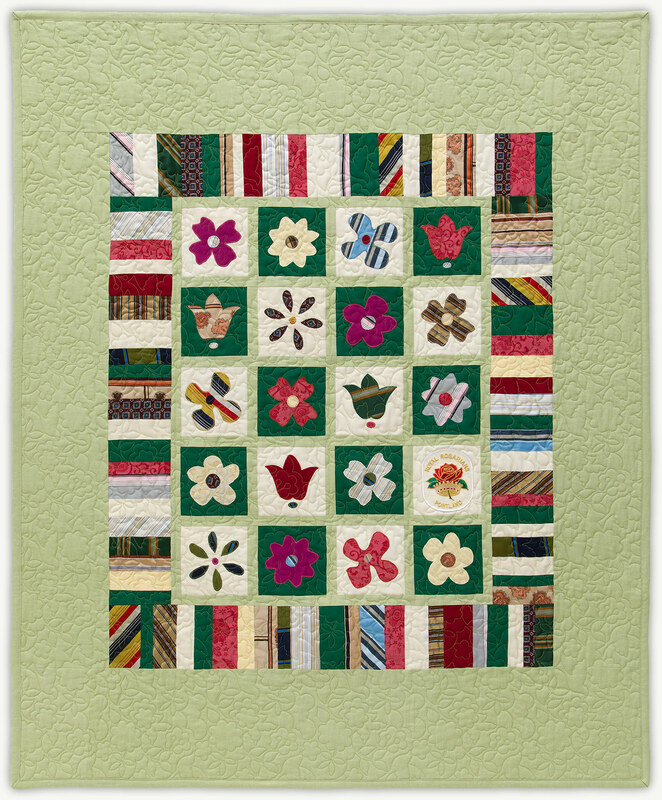 Pricing depends on which pattern you use with your keepsake fabrics. 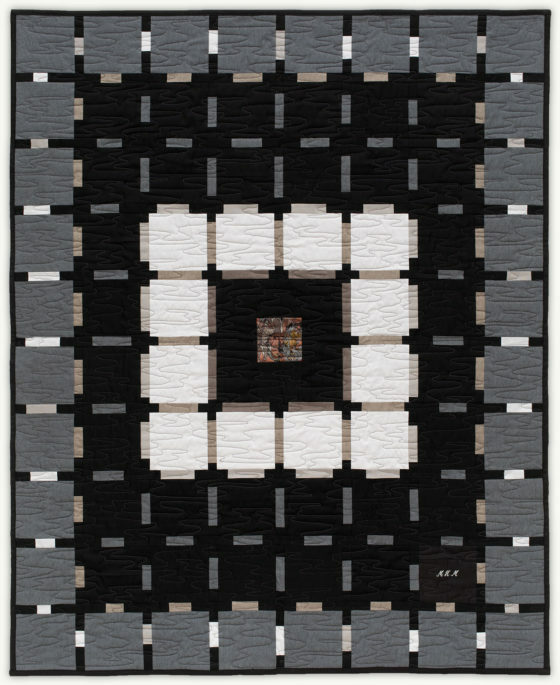 I can't decide whether to order my Memorial Quilt as a wall hanging or a functional bed quilt. This decision is a personal one and needs to be given due thought: some people love the idea of being literally wrapped up with the memories of a loved one, others prefer those memories encapsulated in a wall piece that they can walk by every day. I am happy to talk you through your decision-making process if you’re unsure. What is the average time it takes to complete a memorial quilt? 12-16 weeks on average. 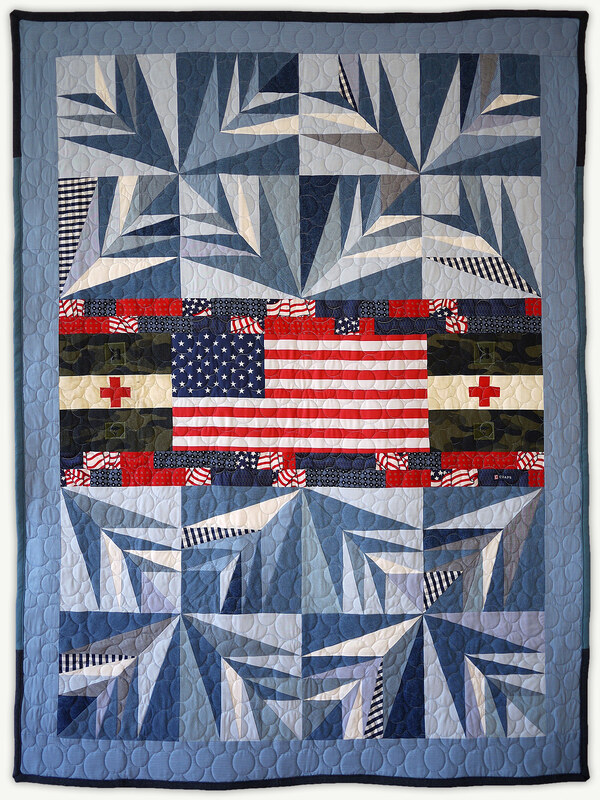 Memorial Quilts require time-intensive work that involves the careful deconstruction of special garments and an individualized reconstruction process. Once the quilt top and back are complete, I work with Nancy Stovall, a highly respected machine quilter, to quilt the layers together. 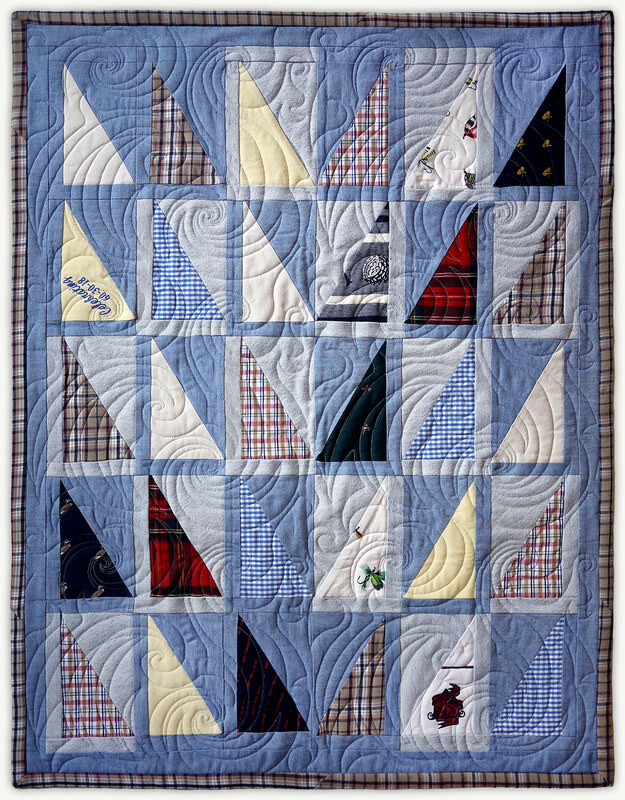 Quilts that use primarily cotton, linen, and some blends may be laundered in a front loading, tumble washer only. Cold water, gentle cycle, air dry. Quilts that may include various combinations of synthetic fabrics should be dry cleaned only. **All fabrics should be laundered according to their instructions before being shipped to me. Ordering a MEMORIAL QUILT always begins with a conversation via e-mail or telephone. It is important for me to gain some understanding of you, the loved one you are honoring, and the types of fabrics you would like to use in your quilt. 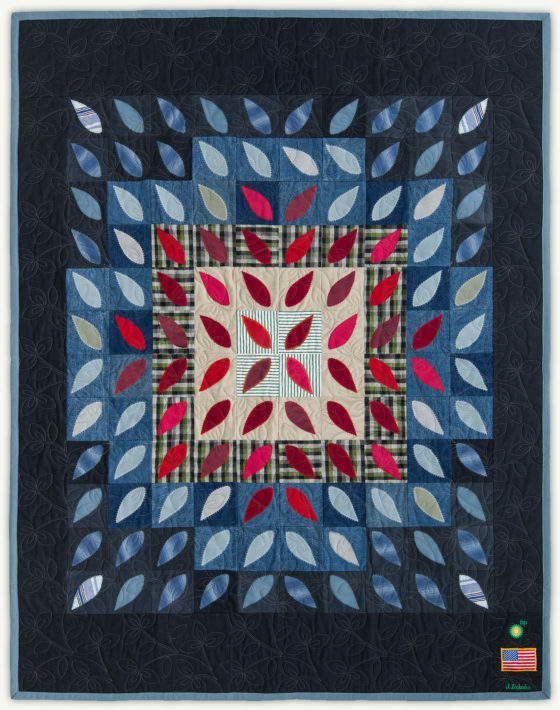 From there, we discuss what quilt pattern would be a good fit as well as its size and end-use. 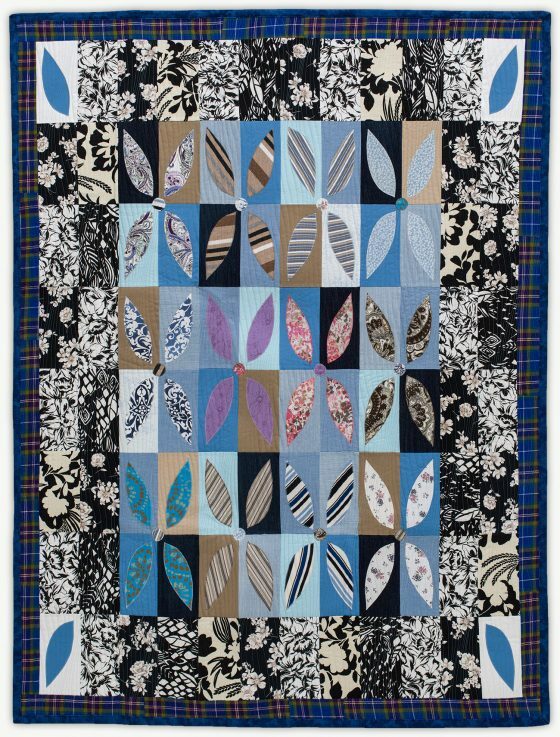 There are times when it’s easier for me to see the actual fabrics first before discussing which quilt patterns would be best. 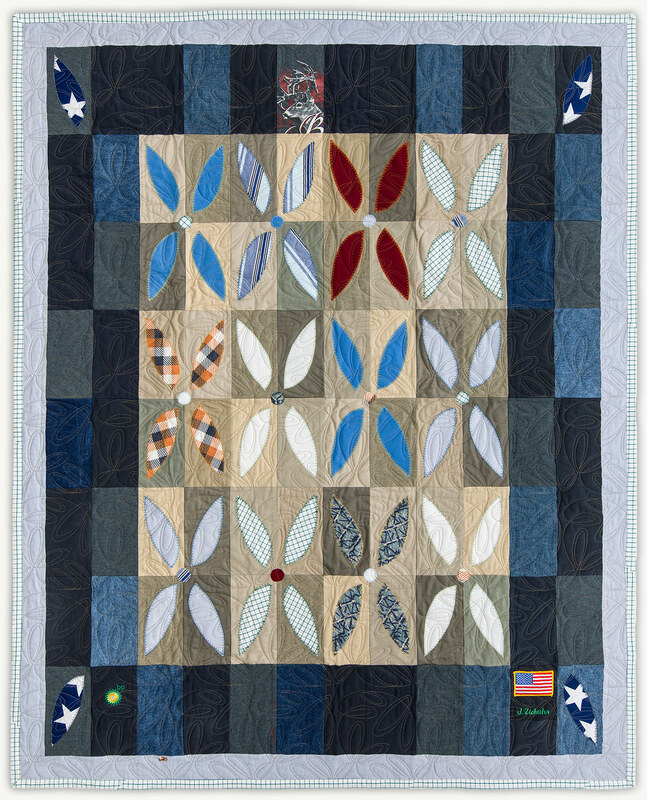 Pricing For pre-established quilt patterns, as seen in the Memorial Quilt Gallery, prices range from $600 for a small wall-hanging to $3,200 for a king-size bed quilt. I will send you a quote after we discuss your specific preferences. For any CUSTOM-DESIGNED quilt pattern, there is an additional $250 non-refundable design fee. 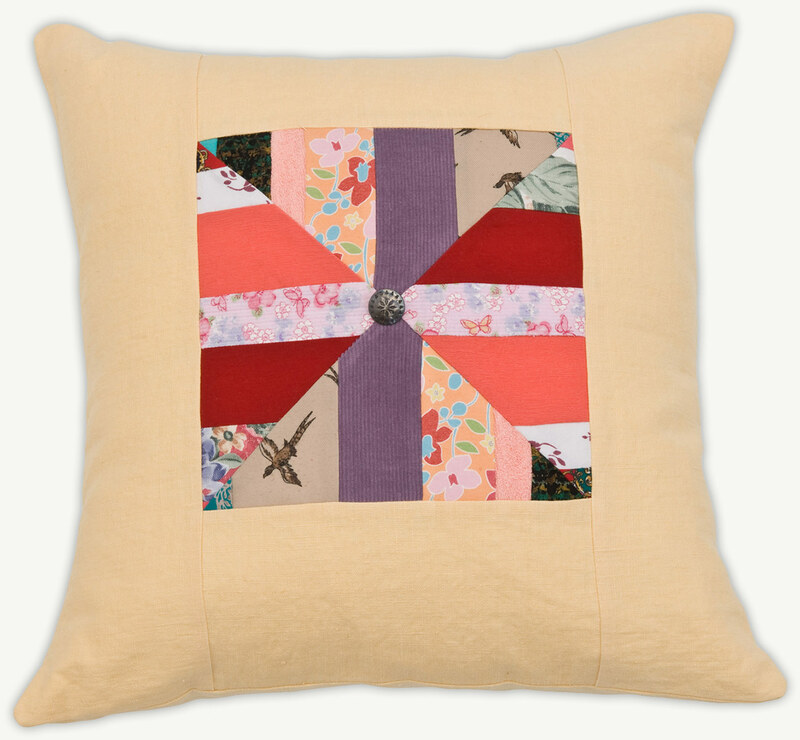 Memorial Pillows (a great option when there are numerous recipients – everyone gets their own pillow.) $125 for a 16″x16″ pillow $175 for a 20″x20″ pillow Terms PAYMENT: 50% deposit required with each order, becoming non-refundable 7 days after order confirmation. 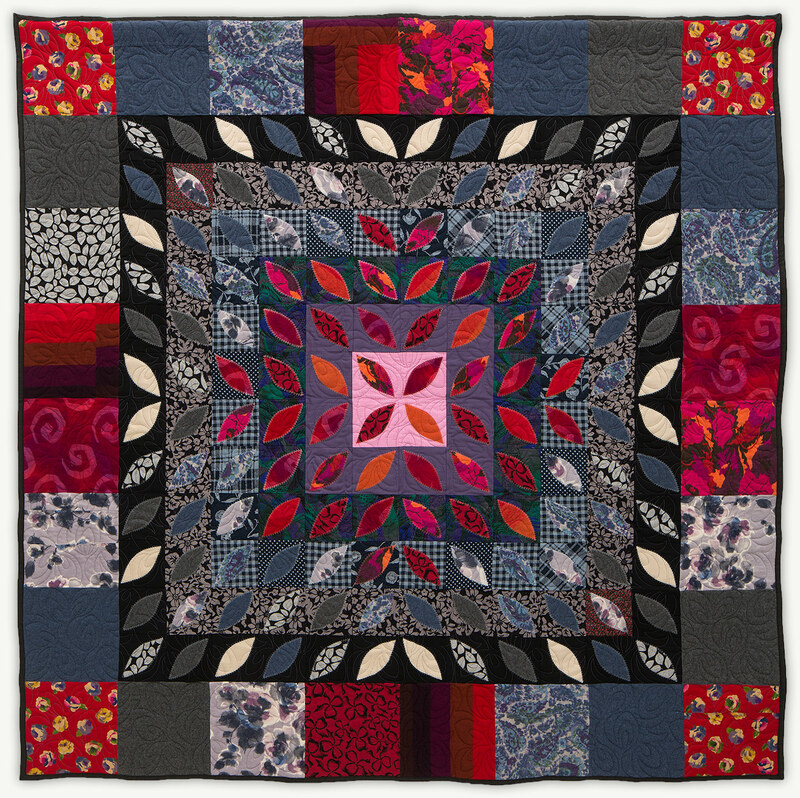 Final payment due once you have received your quilt. DELIVERY: Standard delivery is 14-16 weeks from receipt of deposit. SHIPPING: All packages will be shipped via UPS Ground or USPS Priority. Shipping costs will be added to final invoice. 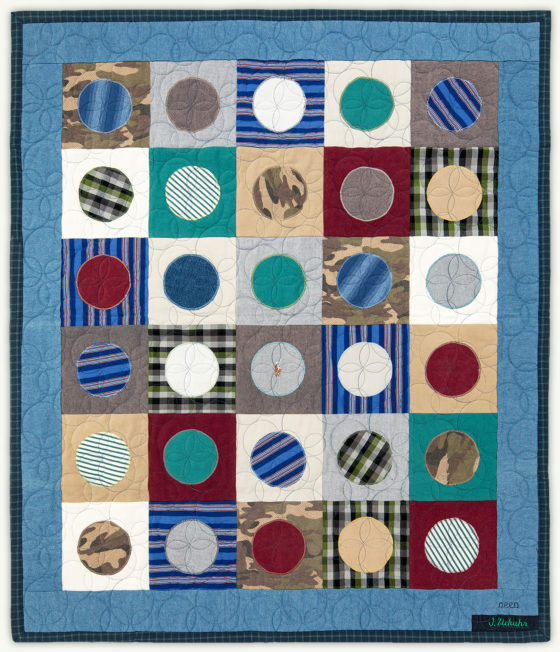 FINAL QUILT dimensions may vary slightly in production. PRICES are subject to change. Jack served in Vietnam and survived his time as a POW. Jack served in Vietnam and survived his time as a POW. He was patriotic and dedicated to helping high school students through counseling. Quilt pattern: CUSTOM. 55"x70"
Barbara spent her life in service to others. Barbara spent her life in service to others. She was the director of mental health for the state of Connecticut, in addition to running a congressional office in Washington D.C. Her dedication to serving the homeless community led to a New Haven Transitional Housing Community being named after her. This quilt was for one of her adopted children. 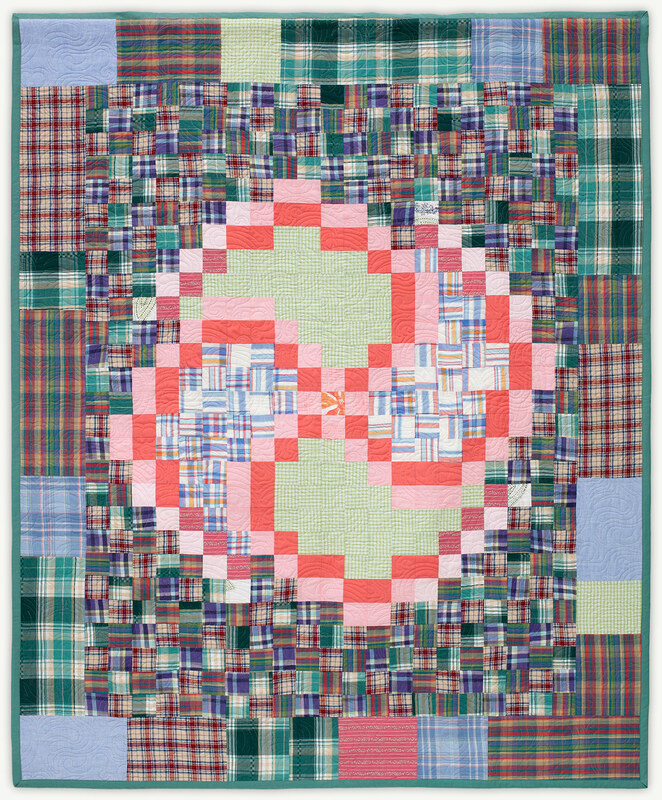 Quilt pattern: NINA. 55"x70"
Barbara spent her life in service to others. She was the director of mental health for the state of Connecticut, in addition to running a congressional office in Washington D.C. Her dedication to serving the homeless community led to a New Haven Transitional Housing Community being named after her. 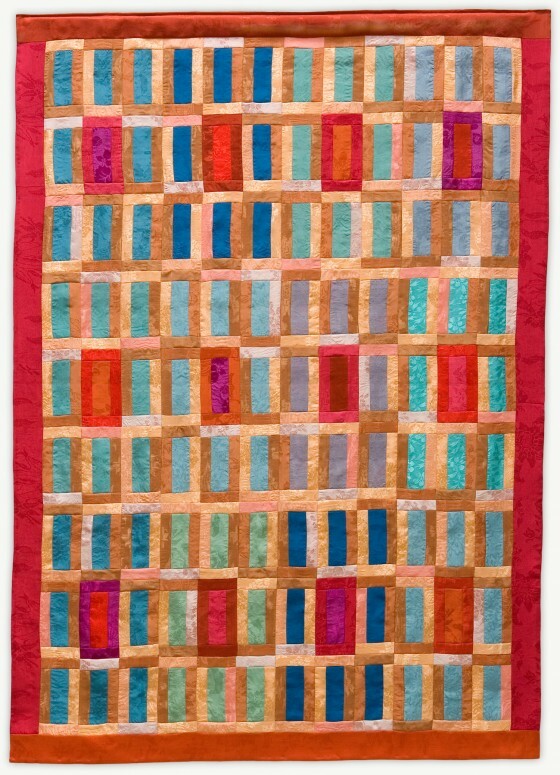 This quilt was for one of her adopted children. Quilt pattern: FRANCES. 55"x70"
Barbara spent her life in service to others. She was the director of mental health for the state of Connecticut, in addition to having run a congressional office in Washington D.C. Her dedication to serving the homeless community led to a New Haven Transitional Housing Community being named after her. 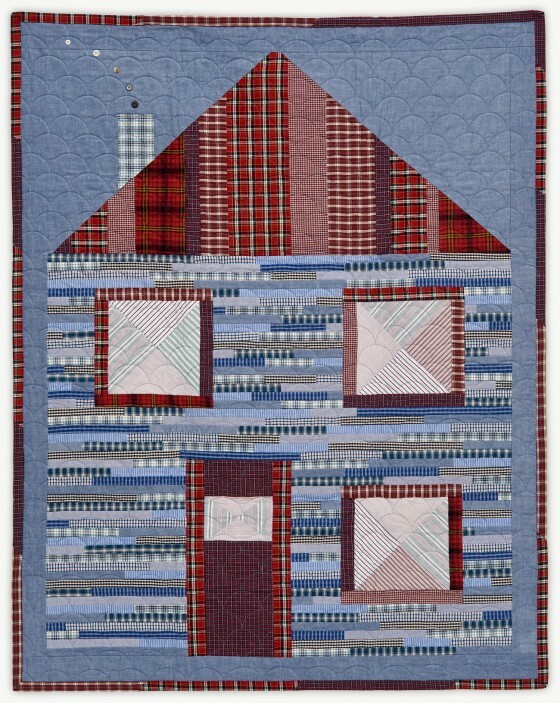 This quilt was for one of her adopted children. 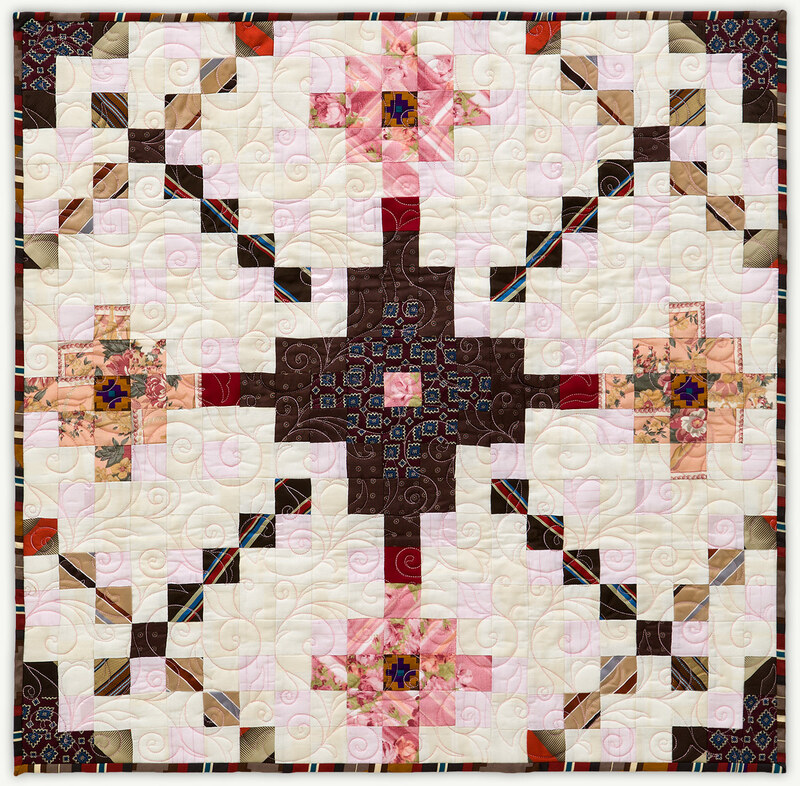 Quilt pattern: LUCKY PENNY. 55"x70"
Michael was a fair and dedicated judge. Michael was a fair and dedicated judge. He loved to scuba dive and to spend time training his beloved Newfoundland dogs. This quilt was made from his judge's robes and a single necktie he wore on special occasions. 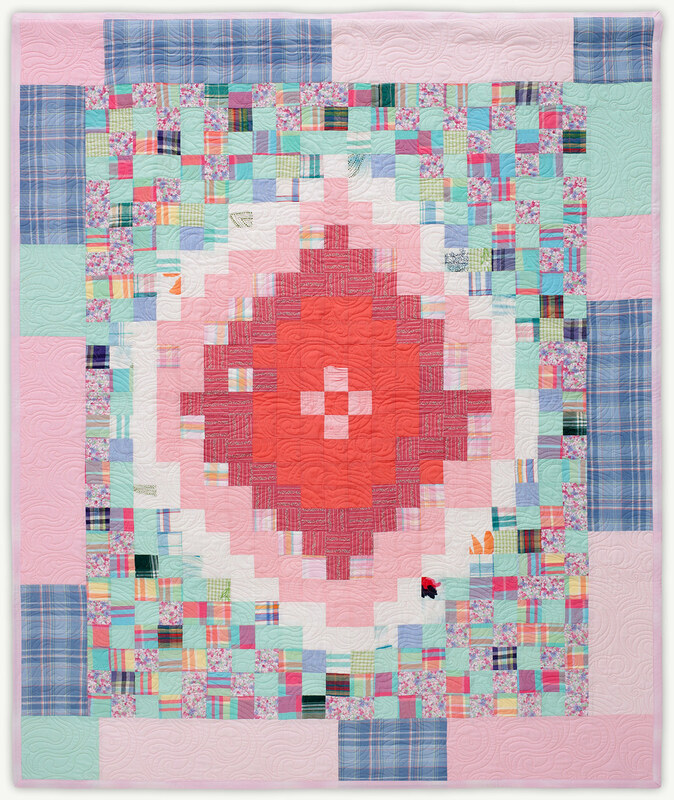 Quilt pattern: GENEVIEVE. 48"x63"
Michael was a fair and dedicated judge. He loved to scuba dive and to spend time training his beloved Newfoundland dogs. This quilt was made from his judge's robes and a single necktie he wore on special occasions. Quilt pattern: GENEVIEVE. 30"x30"
Al served his country and his community for many years. Al served his country and his community for many years. He dedicated years of service to the U.S. Army and to the Concord Police Department. This quilt was made from his "Dress Blues" Army uniform and a few selected neckties. 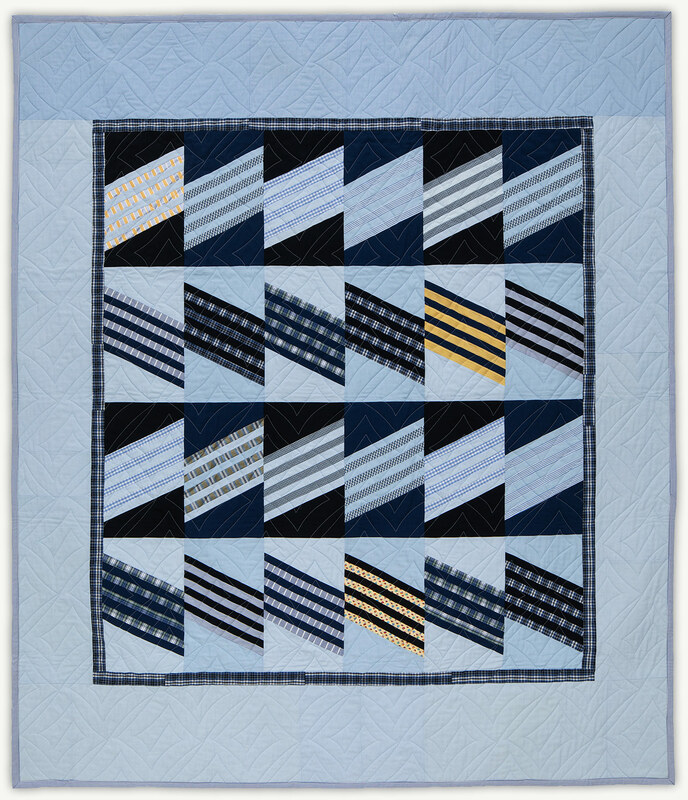 Quilt pattern: AL'S DRESS BLUES. Full bed size. Al served his country and his community for many years. He dedicated years of service to the U.S. Army and to the Concord Police Department. 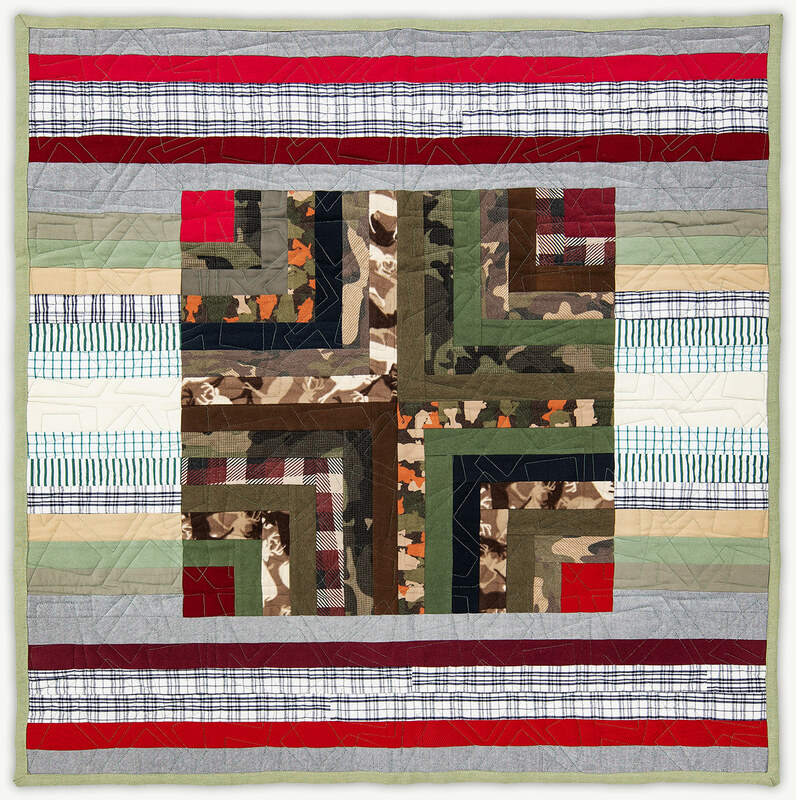 This quilt was made from his dark green Army uniform and his colorful collection of shirts and neckties. Quilt pattern: AL'S COLORS. Full bed size. James was a hard-working, compassionate man. James was a hard-working, compassionate man. For 30 years he worked on BP's largest frigate, The Thunder Horse. 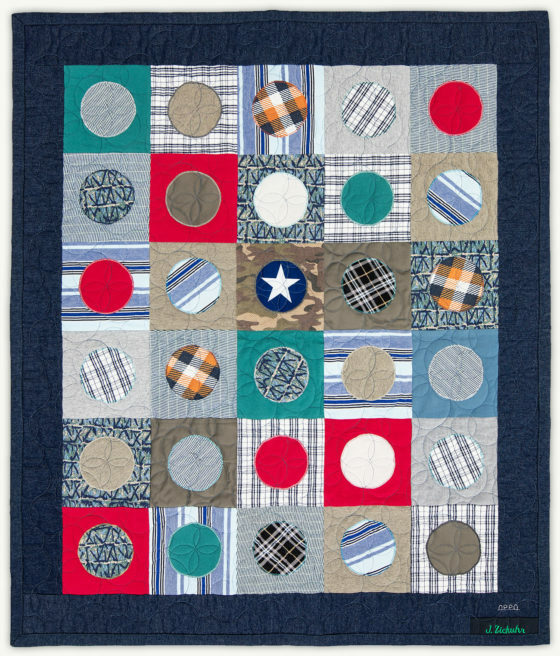 This quilt was for his grandson, Luke. 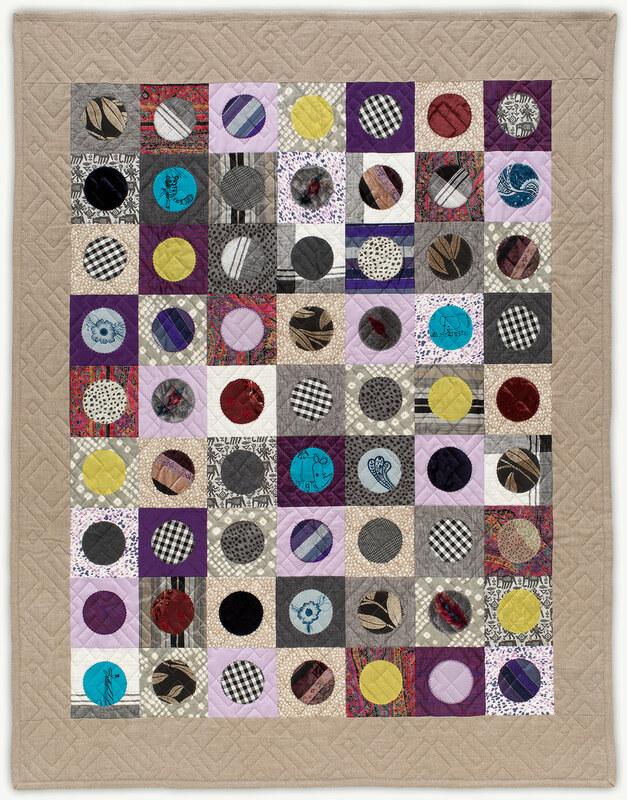 Quilt pattern: PENNY. 39"x45"
James was a hard-working, compassionate man. For 30 years he worked on BP's largest frigate, The Thunder Horse. This quilt was for his grandson, Jack. Quilt pattern: PENNY. 39"x45"
James was a hard-working, compassionate man. For 30 years he worked on BP's largest frigate, The Thunder Horse. Quilt pattern: LOG CABIN VARIATION 2. 36"x36"
James was a hard-working, compassionate man. For 30 years he worked on BP's largest frigate, The Thunder Horse. 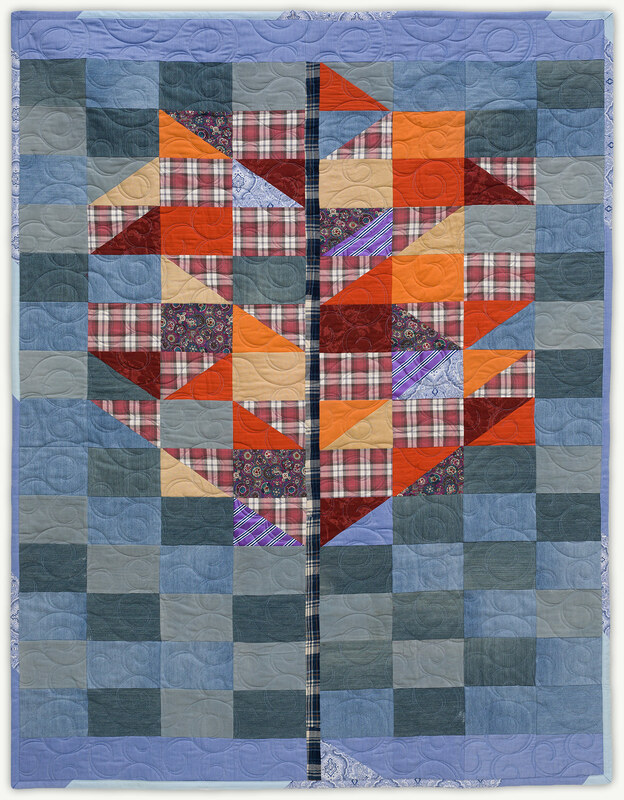 Quilt pattern: LOG CABIN VARIATION 1. 36"x36"
James was a hard-working, compassionate man. For 30 years he worked on BP's largest frigate, The Thunder Horse. The flag and embroidery are from his BP work uniform. Quilt pattern: HARVEST. 55"x70"
Michael was a talented musician and dedicated hospice physician. Michael was a talented musician and dedicated hospice physician. He also loved to draw, write poetry, and tell a good joke. Quilt pattern: MICHAEL'S TUNE. 55"x70"
James was a hard-working, compassionate man. For 30 years he worked on BP's largest frigate, The Thunder Horse. The flag and embroidery are from his BP work uniform. 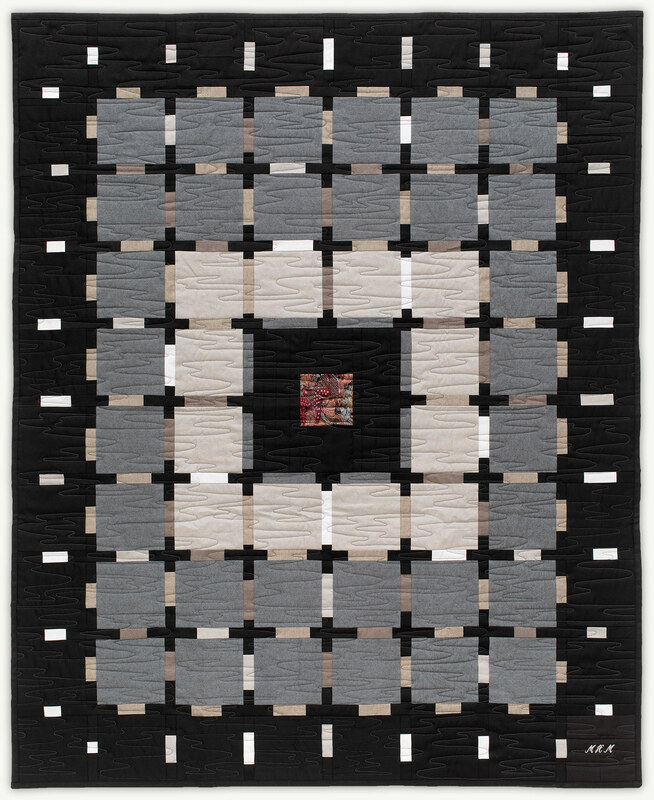 Quilt pattern: NINA. 55"x70"
James was a hard-working, compassionate man. For 30 years he worked on BP's largest frigate, The Thunder Horse. The flag and embroidery are from his BP work uniform. 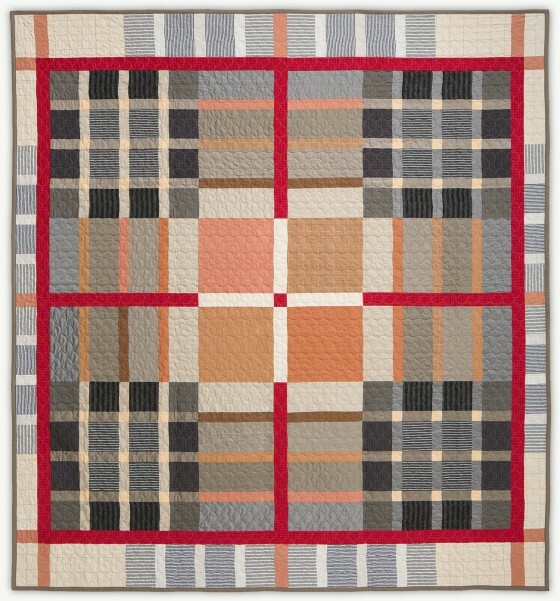 Quilt pattern: LEWIS. 55"x70"
James was a hard-working, compassionate man. For 30 years he worked on BP's largest frigate, The Thunder Horse. The flag and embroidery are from his BP work uniform. 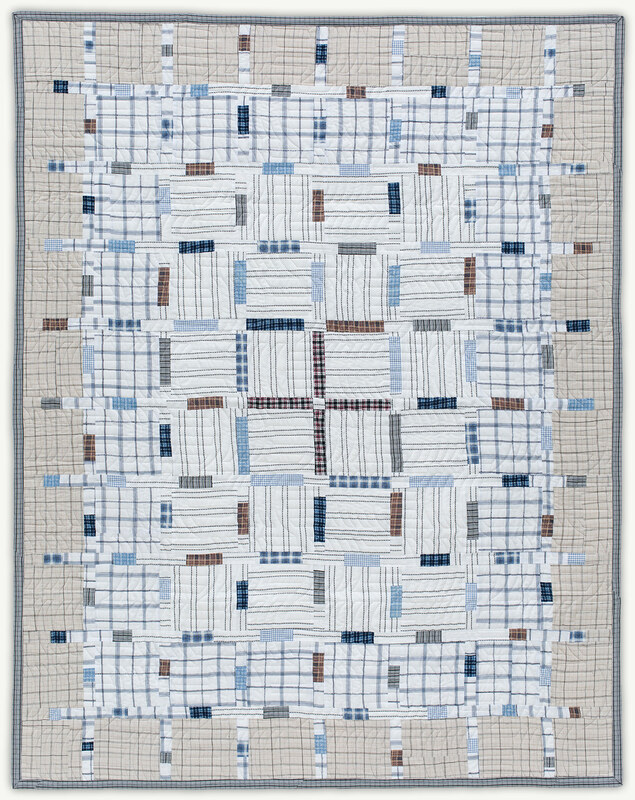 Quilt pattern: SOLACE. 55"x70"
James was a hard-working, compassionate man. He worked for 30 years on BP's largest frigate, The Thunder Horse. The flag and embroidery are from his BP work uniform. Quilt pattern: SOLACE. 55"x70"
Colin was committed to the preservation of Africa's big cats and elephants. Colin was committed to preserving the lives of Africa's big cats and elephants. This passion also led him to connecting with the Maasai tribesmen. 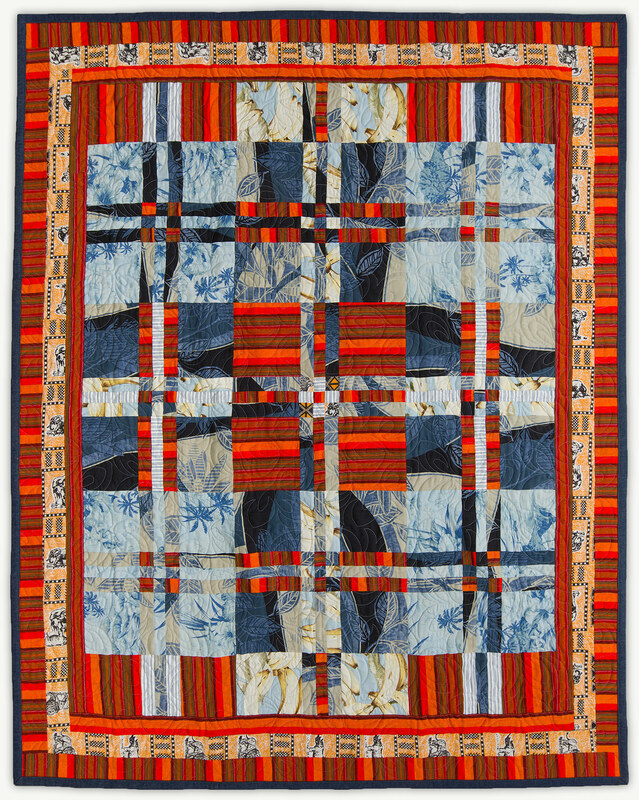 Colin bought the orange striped Maasai shuka cloth on one of his many trips to Africa, and it became the foundation for the quilt. 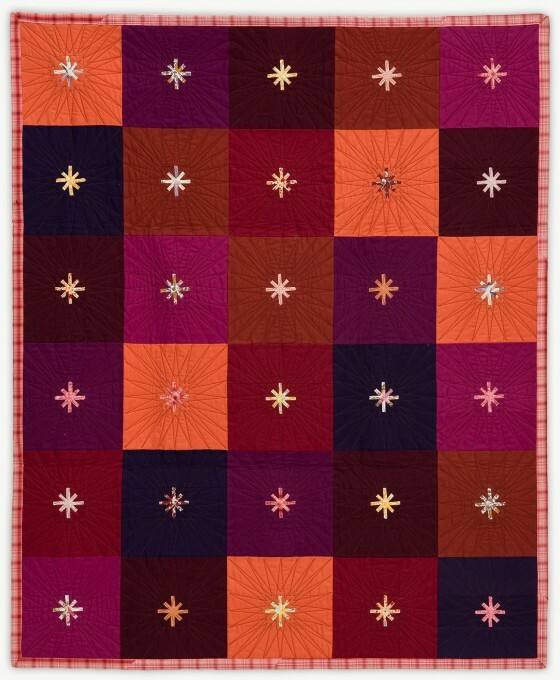 Custom Quilt pattern. Throw size (55"x70"). Dirck loved Islamic art and architecture. Dirck loved Islamic art and architecture. 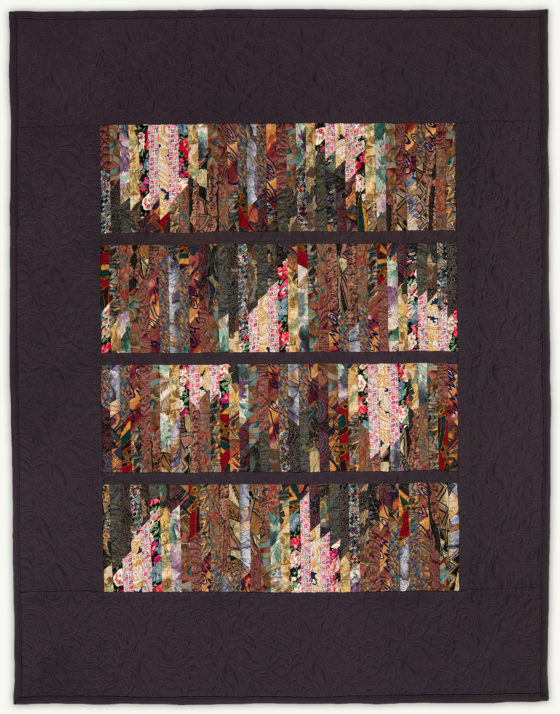 He traveled extensively throughout the Middle East, collecting textiles along the way. 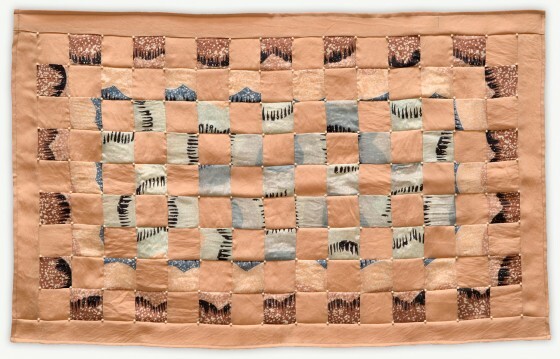 This quilt is made from fabrics from his collection. Quilt pattern: ISLAMIC STAR. 58"x73". A tree to remember. Emma was quite young when her father, Dan, died. Her quilt combines her father's, grandmother's, and great-grandparents' clothing. 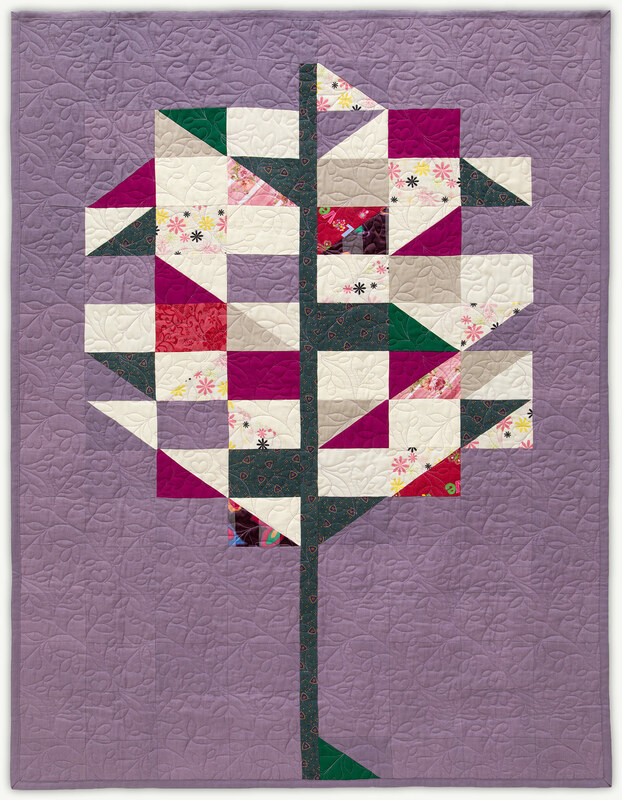 Quilt pattern: TREE. 55"x70"
A tree to remember. Lizzie was quite young when her father, Dan, died. 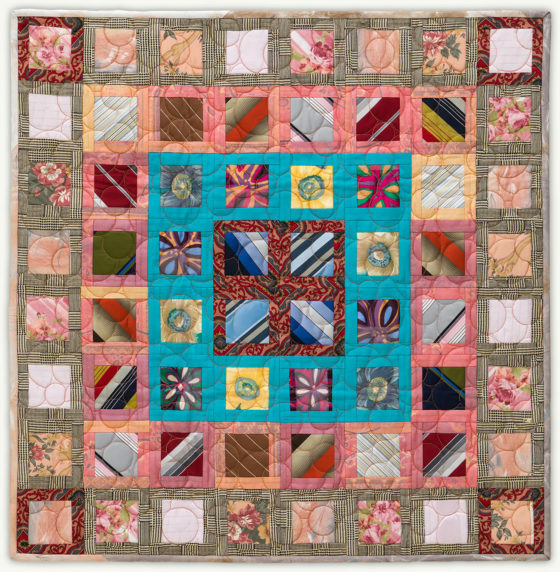 Her quilt combines her father's, grandmother's, and great-grandparents' clothing. 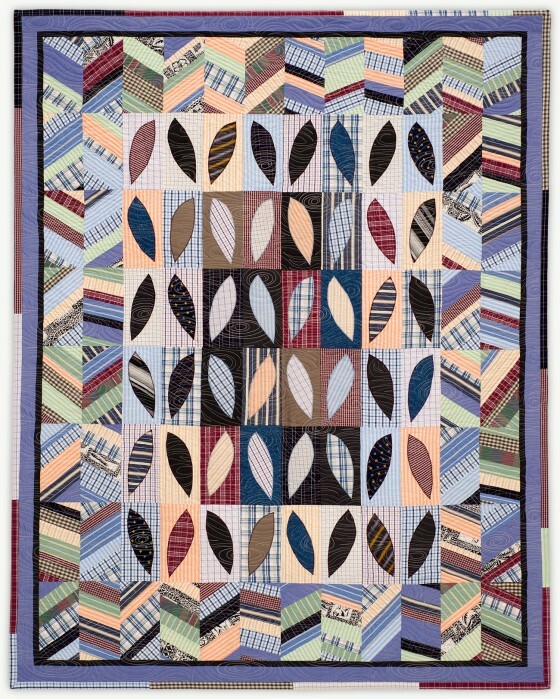 Quilt pattern: TREE. 55"x70"
Margaret loved to garden. 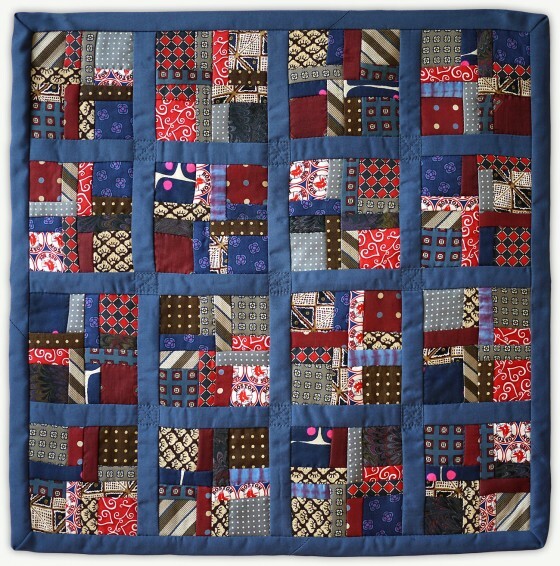 Her quilt combines some of her own clothes with the clothing from the daughter and husband she lost. Quilt pattern: FLOWER PATCH. 55"x70"
Renda loved the color red. Renda loved the color red. Her daughter requested that her quilt contain many of Renda's red shirts. 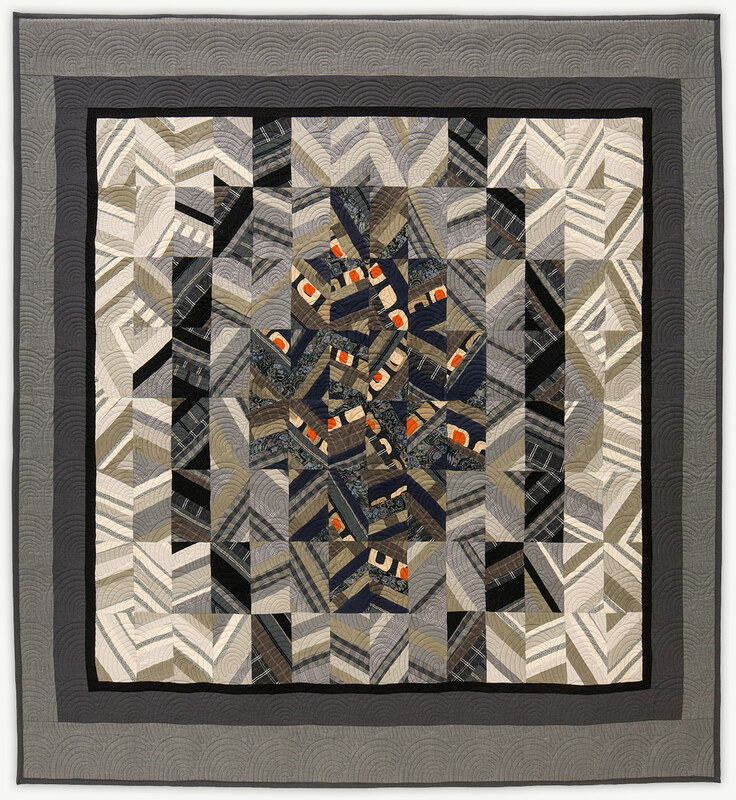 Quilt pattern: SQUARES. 55"x70"
Renda was a talented musician. Renda was a talented musician. 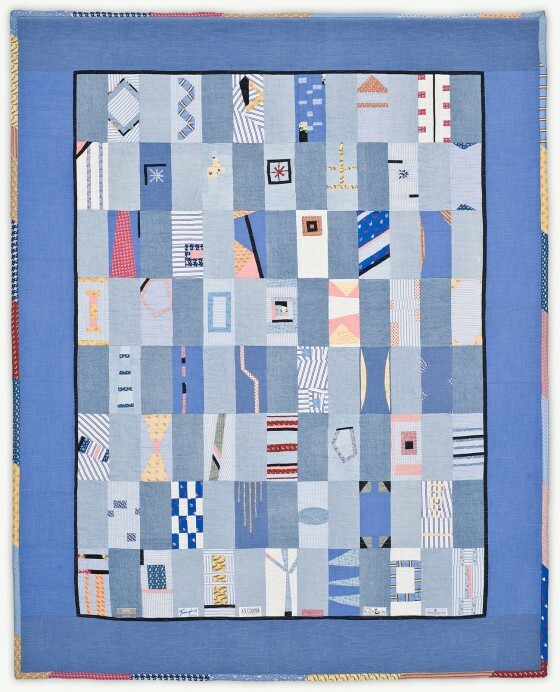 She always wore her silver silk jacket whenever she performed with her chamber orchestra, so it became the center of the quilt for her husband. 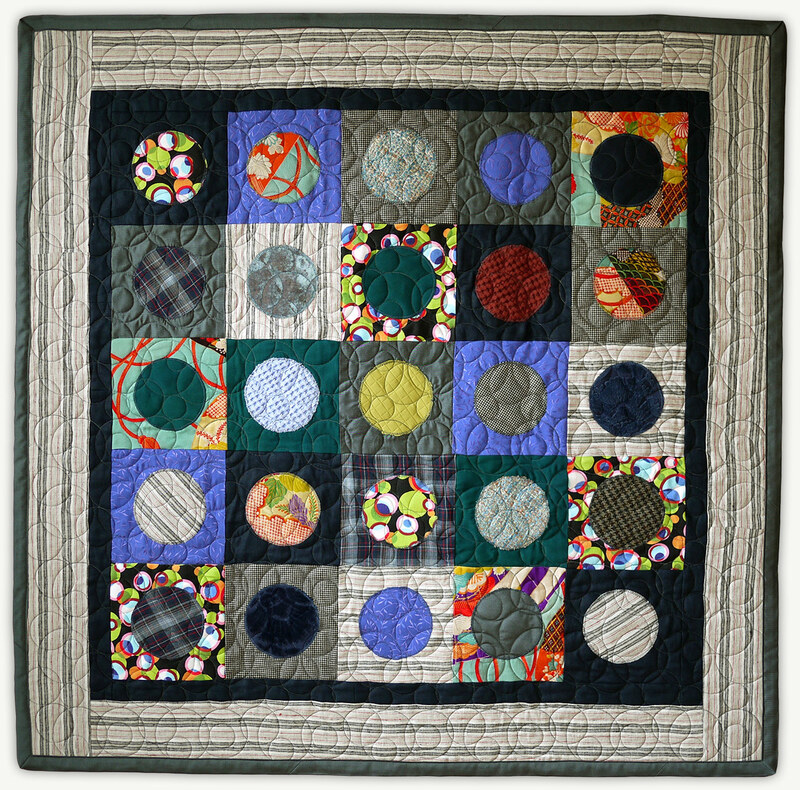 Quilt pattern: SQUARES. 55"x75"
Clyde and Margaret were quite a team. Clyde and Margaret were quite a team. 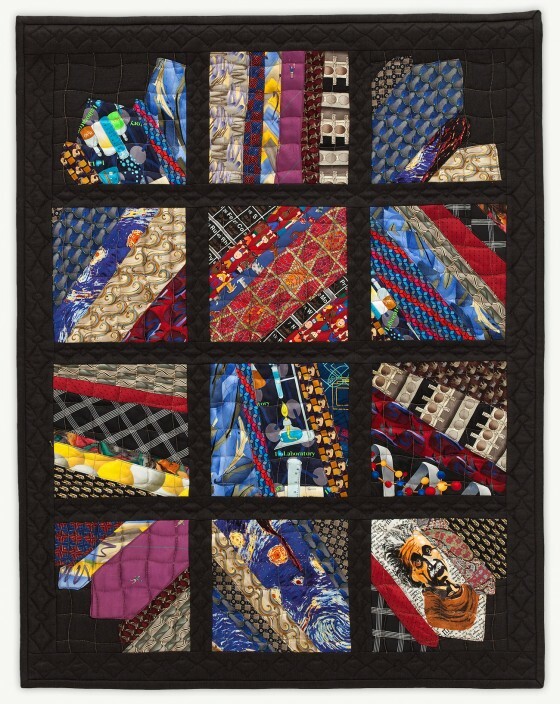 This wall-quilt combines Clyde's neckties and Margaret's scarf collection. It was made for their grandson. 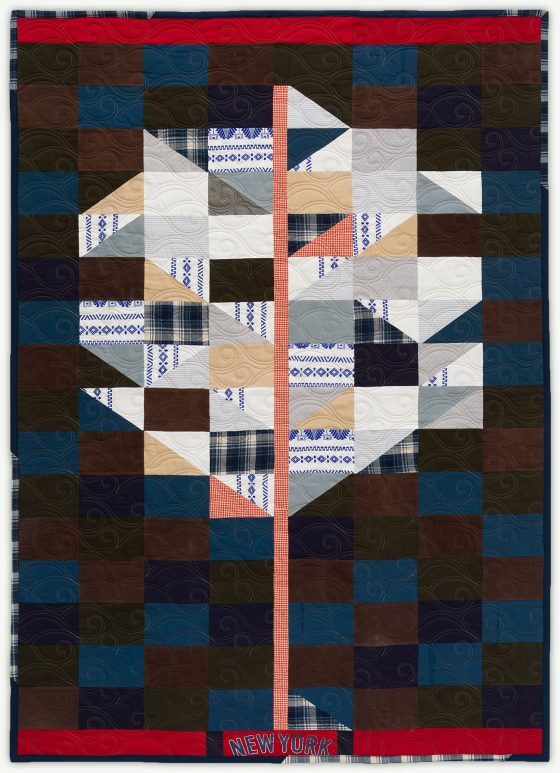 Quilt pattern: MESA. 42"x42"
Clyde and Margaret were quite a team. 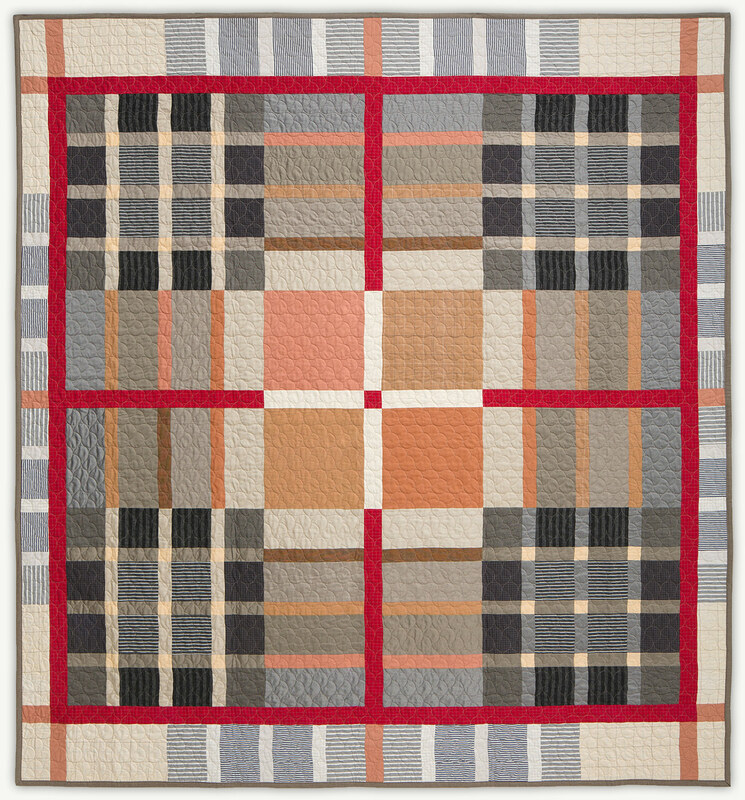 This quilt combines Clyde's neckties with Margaret's scarf collection and was made for their grandson. Quilt pattern: WINDOWS. 42"x42"
Sam loved to write poetry and song lyrics. Sam loved to write poetry and song lyrics. He was committed to protecting the environment and supporting locally grown food production. 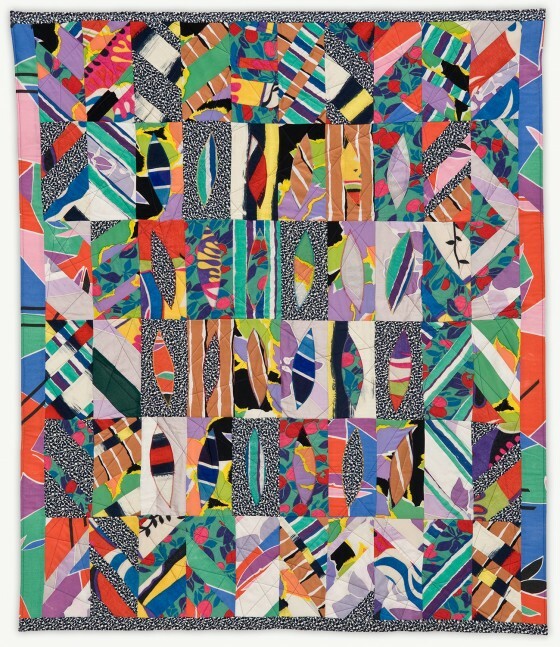 This quilt was made for his mother. 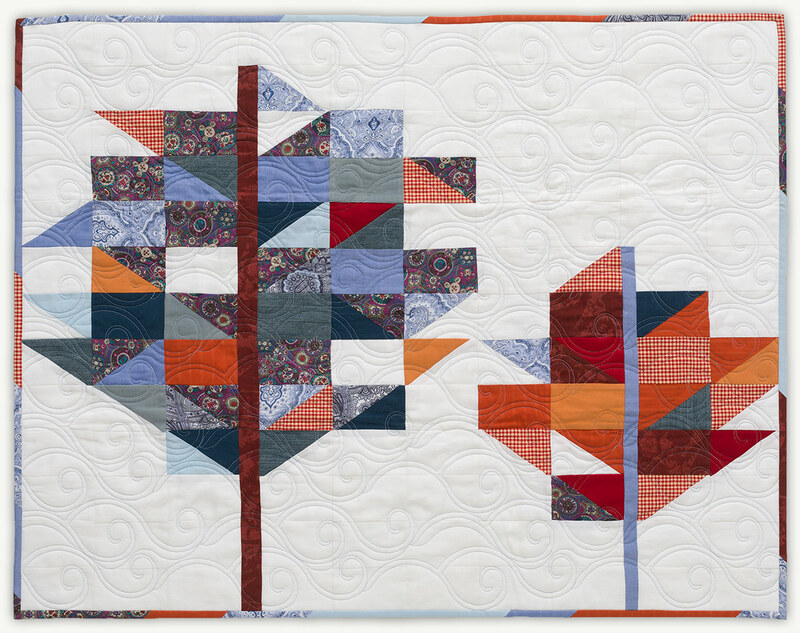 Quilt pattern: Two Trees. 31"x40" wall hanging. Sam was committed to protecting the environment. Sam was committed to protecting the environment and to making sure that inner city citizens had access to fresh, locally grown food. He was a devoted friend to many individuals. 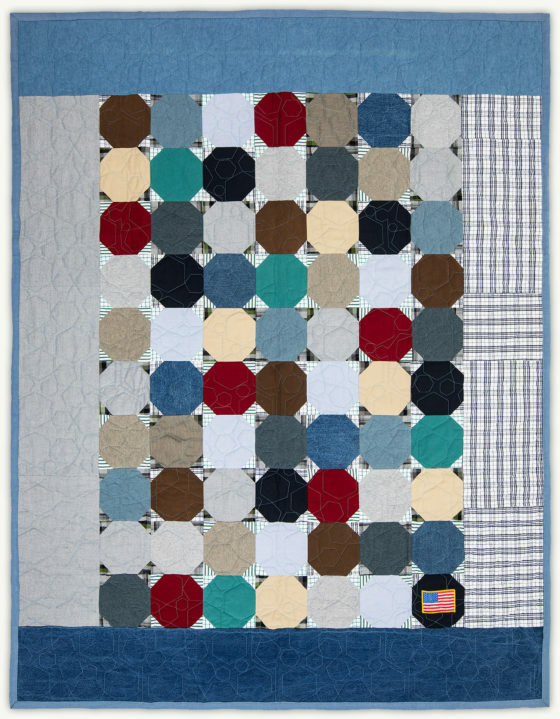 This quilt was made for his brother, Rob. Quilt pattern: TREE. Throw size. Sam had a special connection to the natural world. Sam had a special connection to the natural world. He had a big heart and was a true friend to those close to him. This quilt was made for his sister, Lilly. Quilt Pattern: TREE. Throw size. Youssef was a man of many talents. Youssef was a man of many talents. 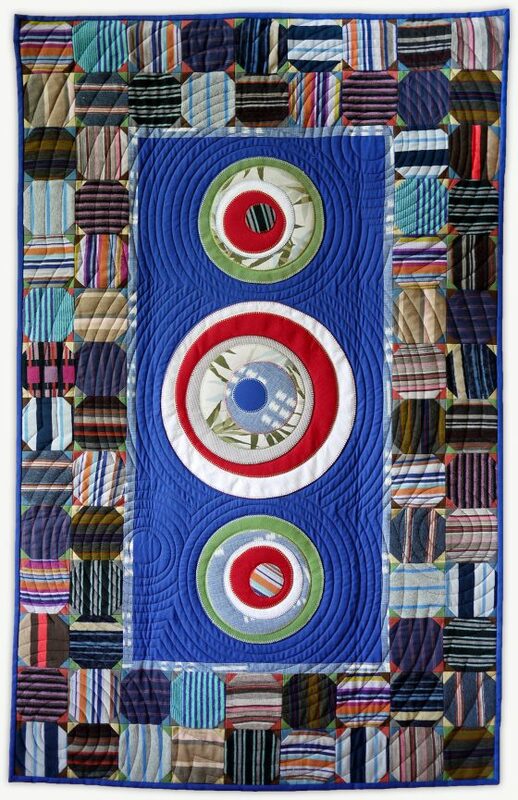 According to his wife, he was impeccably dressed from toe to ankle, and thusly his quilt was made from his collection of colorful socks. 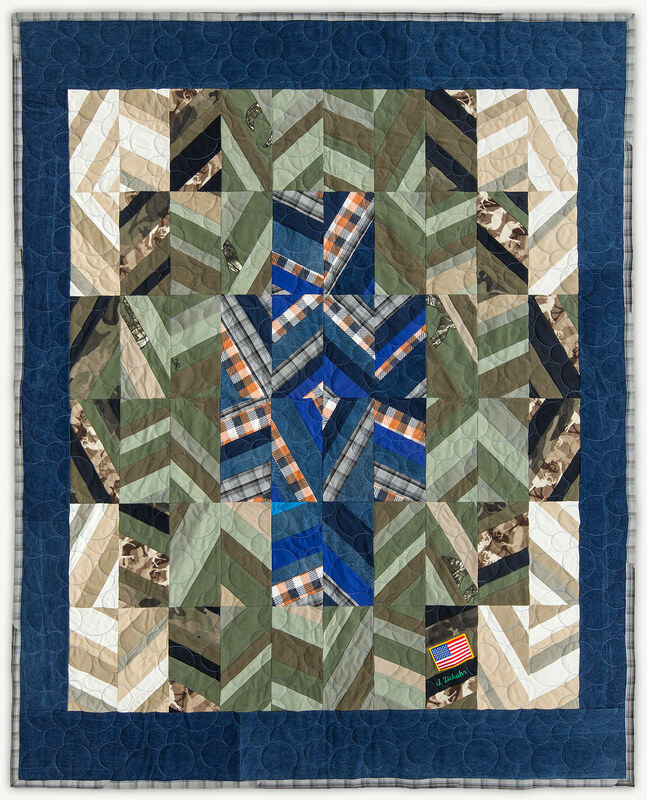 Quilt Pattern: CUSTOM. 26"x50"
Jim loved sailing and the outdoors. Jim loved to sail, fly-fish, golf, and spend time with his family. He gave an immense amount to his community and enjoyed the friendship of many. 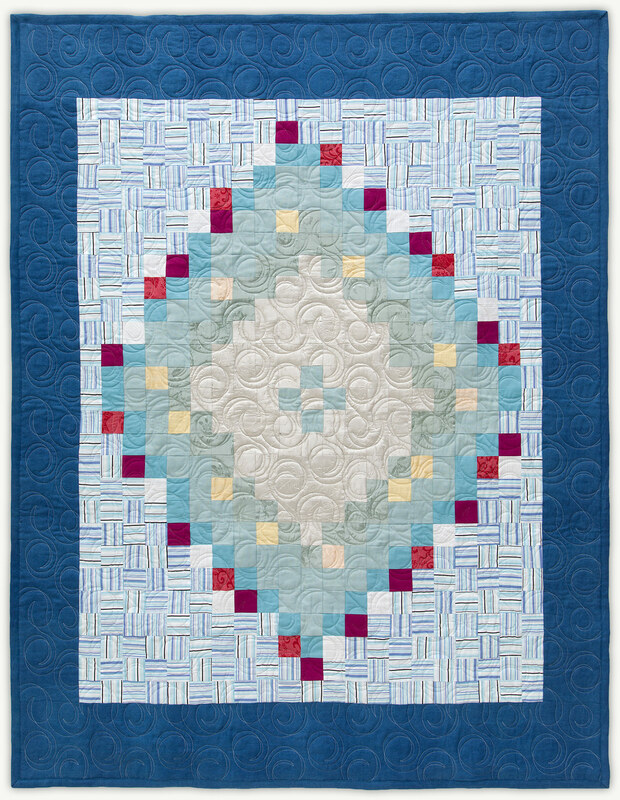 Quilt Pattern: SAILS. 32"x42"
Sorrel was a beautiful little girl who left before her time. Sorrel was a beautiful little girl who left before her time. She loved flowers and going to the river, and she had the resonant eyes of an old soul. Nina's Gran was a devoted caretaker. Nina's Gran was a devoted caretaker. She was a stylish dresser, loved flowers, and the color blue. Alfredo was an engineer and always had a project going on his workbench. Alfredo was an engineer and always had a project going on his workbench. He was the last born son of Italian immigrants and the first to be born in the U.S. He loved practical jokes, pasta, and work, especially work he could do with his hands. When he passed away, he had tools on the table waiting for his next project. He was married to his adoring wife for 53 years and is sorely missed by his entire family. 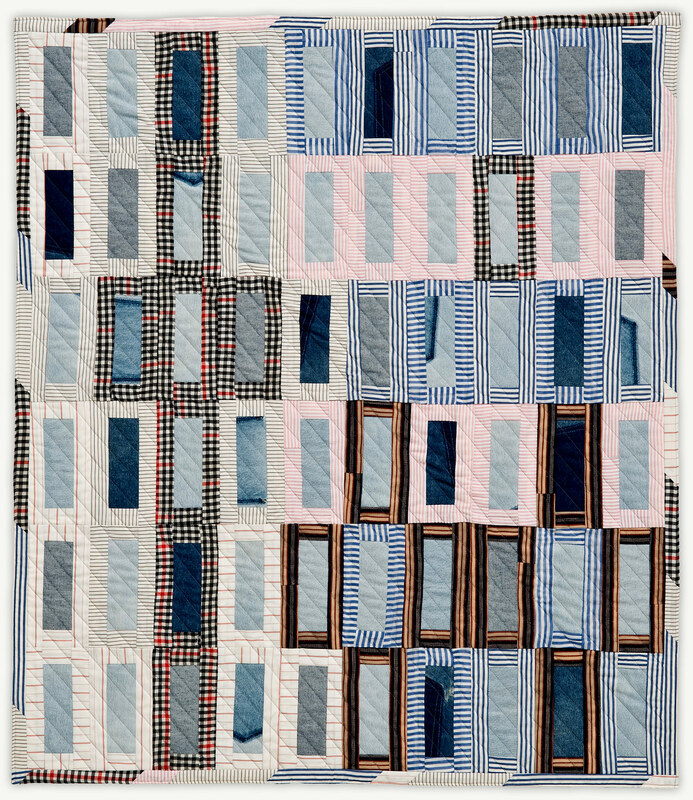 The quilt was made from a collection of his shirts. Quilt Pattern: ECLIPSE. 55"x70"
Debbie was a strong, passionate woman who had a wry wit. Debbie was a strong, passionate woman who had a wry wit. She loved her family and her German Shepherd, Pacah. 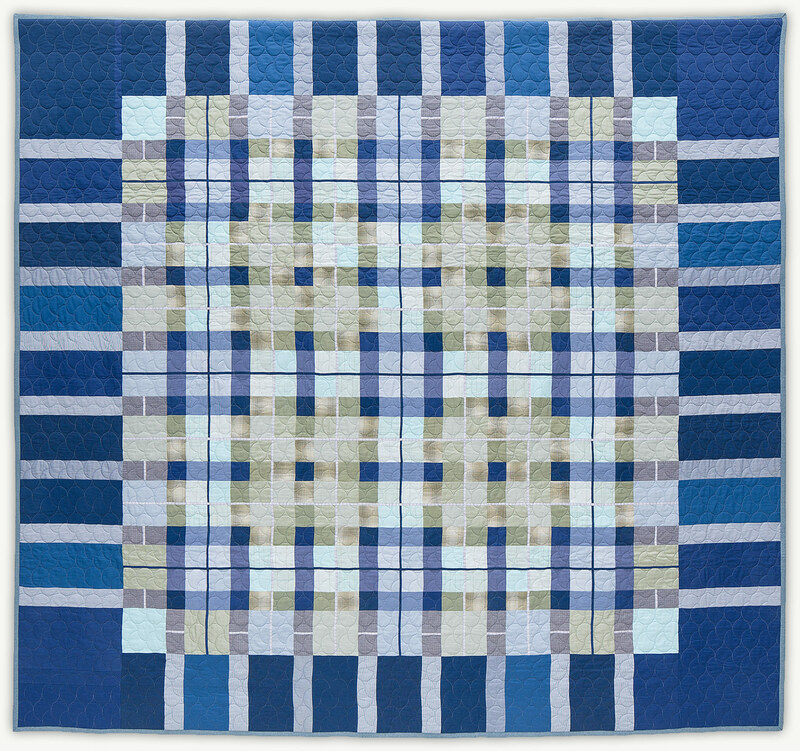 This quilt pattern was based on the MacCallum tartan design. 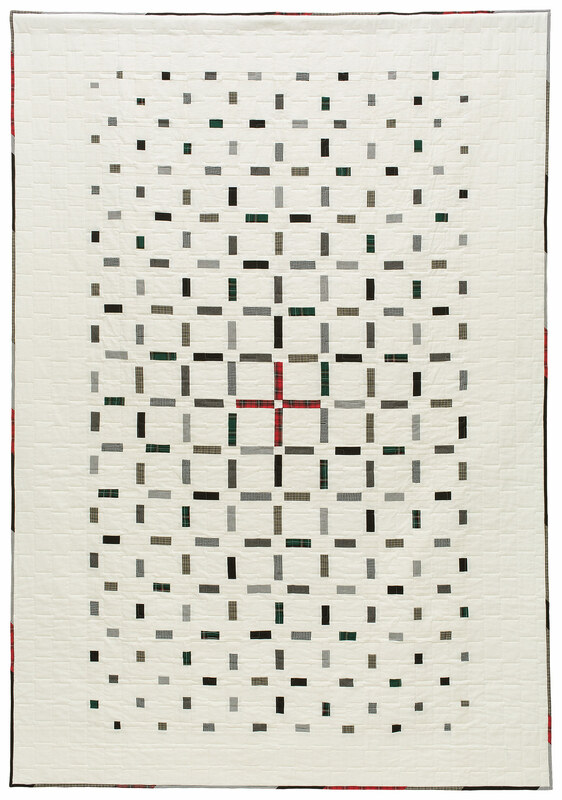 Quilt Pattern: CUSTOM. 112"x"104"
Frances adored flowers and had immaculate taste in clothing. Frances was a world traveler and took long walks in the sunshine. She loved flowers and so it seemed fitting to design a quilt into one large flower. 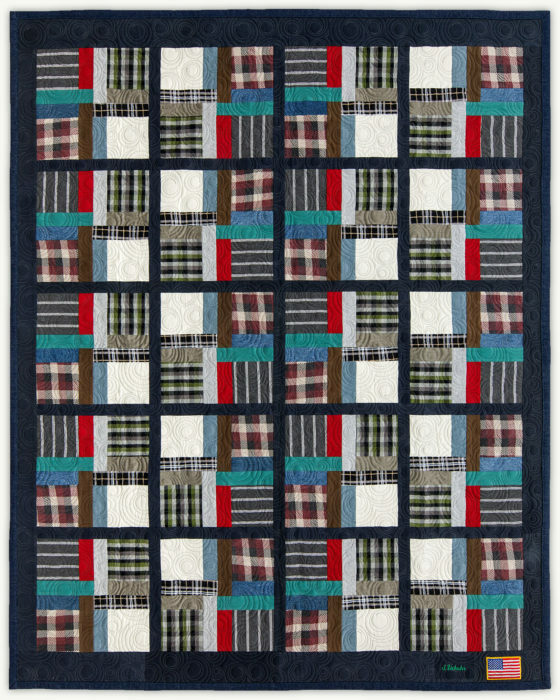 Quilt pattern: CUSTOM. 82"x82"
Amanda loved coloring books. 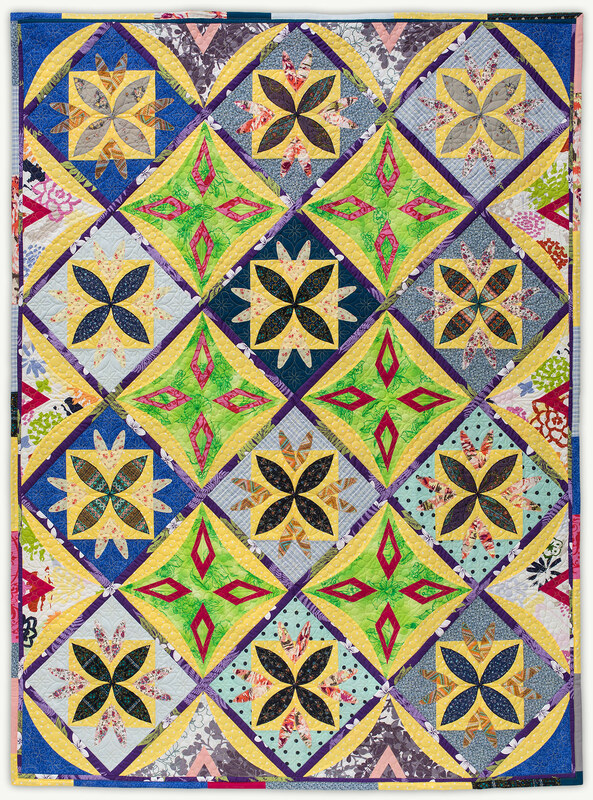 This quilt was inspired by some of her colorings. Amanda loved coloring books. 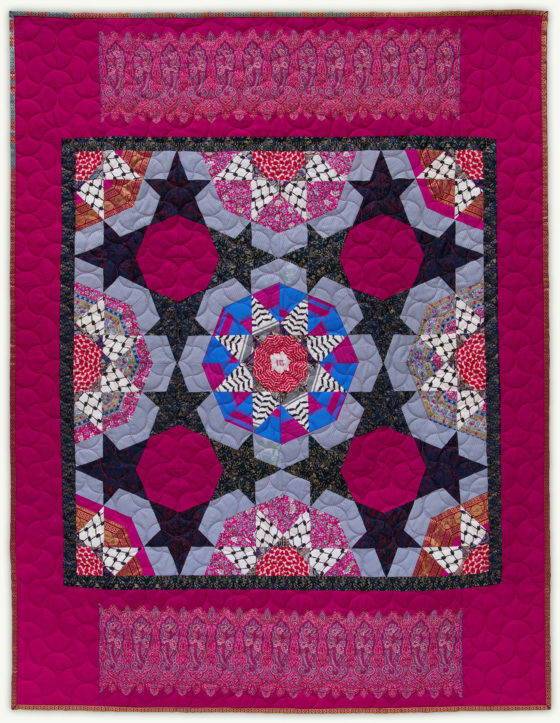 This quilt was inspired by some of her colorings. 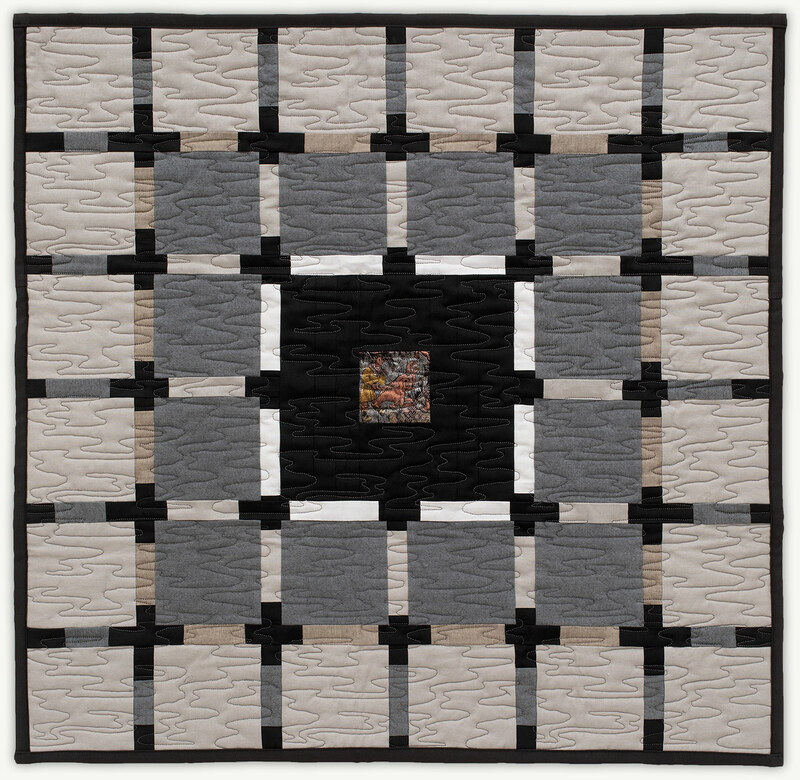 Quilt Pattern: CUSTOM. 66"x87"
Mary loved the ocean and the seashore. Mary loved the ocean and the seashore. 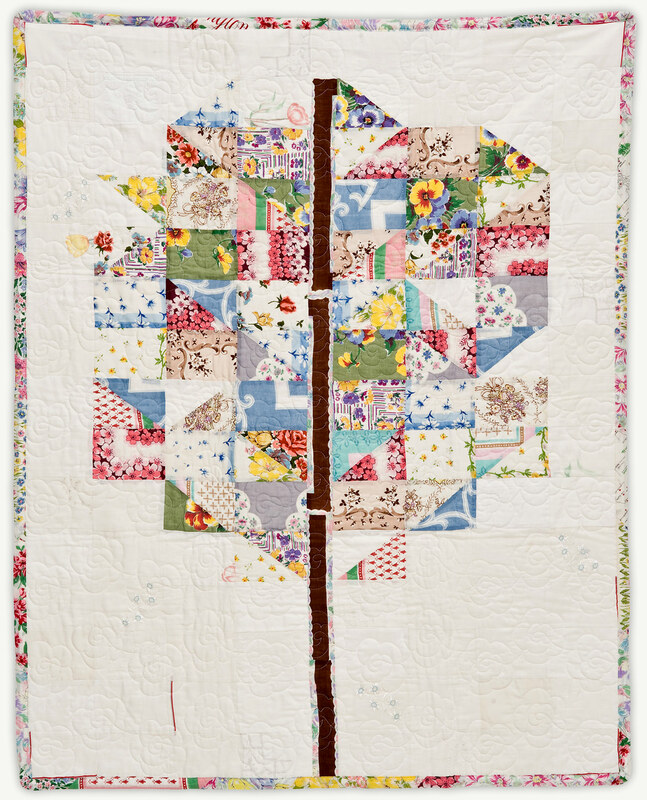 This quilt was made from only three of her garments, one of which had a big fish print on it. Quilt pattern: CUSTOM. 30"x30"
Debbie was a strong, passionate woman who was not afraid to call a spade a spade. Debbie was a strong, passionate woman who was not afraid to call a spade a spade. 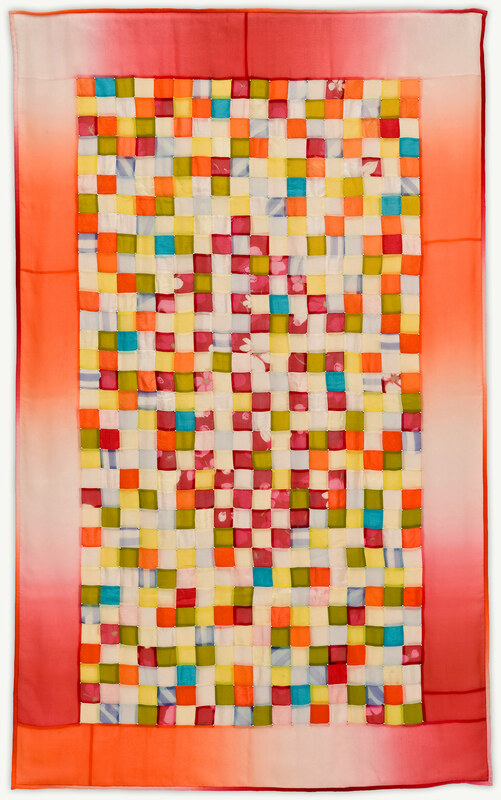 This quilt was made from her gorgeous collection of tailor-made shirts. Quilt pattern: CUSTOM. 108"x100"
Zadie was a bow tie kind of guy. Zadie was a bow tie kind of guy and a bit of an iconoclast. A stalwart Bostonian, he wasn't afraid to challenge the status quo. Quilt pattern: CUSTOM. 16"x16"
Laura was celebrated for her curious and loving spirit. Laura was celebrated for her curious and loving spirit. She was a superb chef, master seamstress, and wonderful mother. 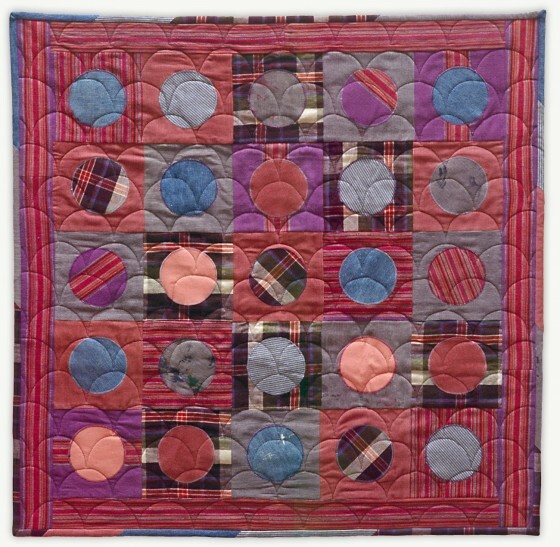 Quilt Pattern: LUCKY PENNY 40"x40"
Genevieve was a vibrant, hard-working woman who had a great sense of humor. Genevieve was a vibrant, hard-working woman who had a great sense of humor. She was a dedicated nurse and enjoyed playing bridge in her spare time. 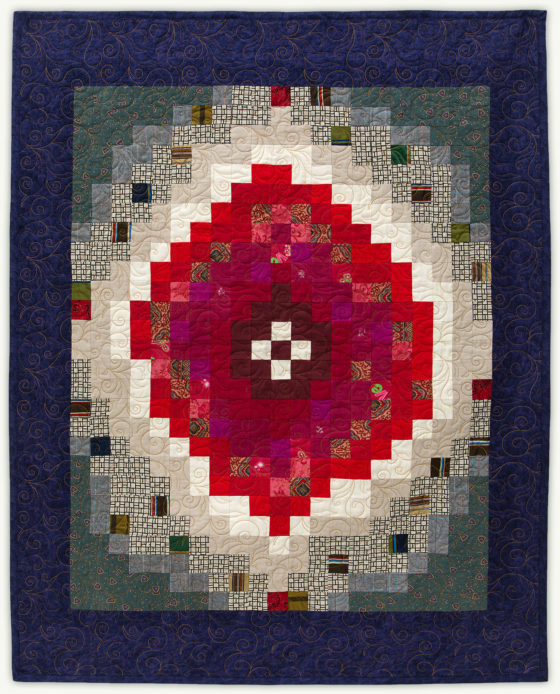 Quilt pattern: ECLIPSE. 62"x89"
Joan was a generous member of her community. Lewis loved his family and enjoyed living life to its fullest. Andy was a professor who loved teaching and inspiring his students. Andy was an inspiration to his community. Each tie sewn into this quilt illustrates his many passions. 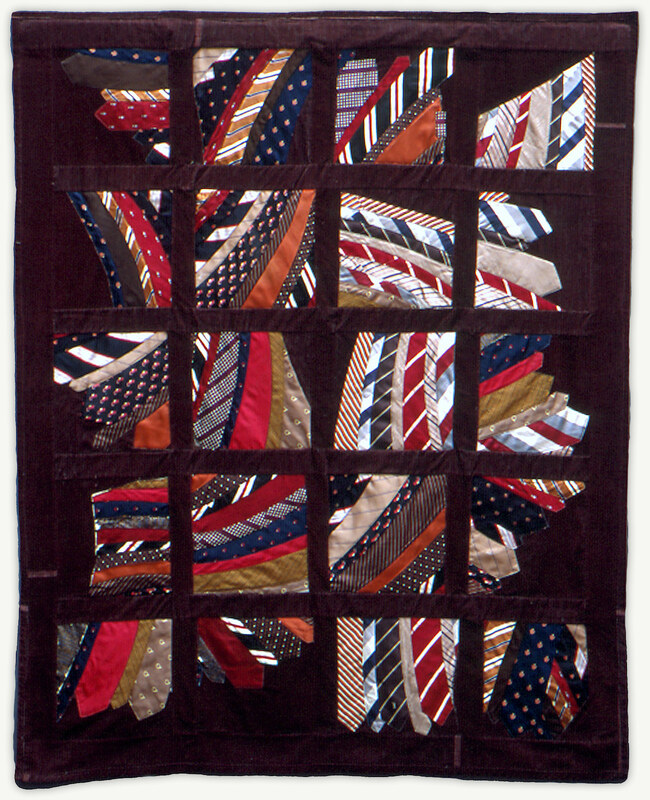 Quilt pattern: TIES. 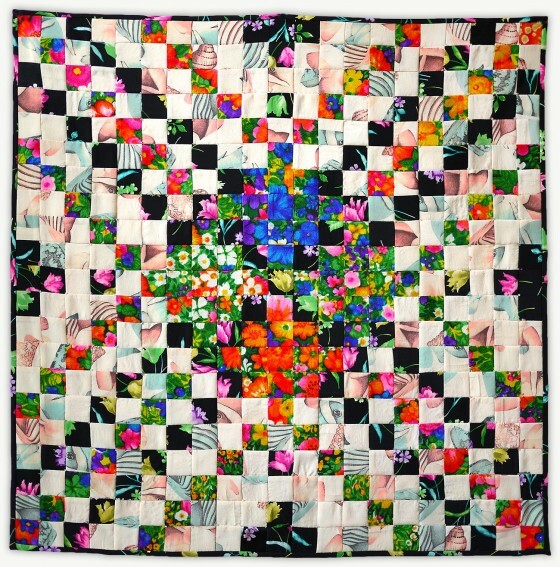 30"x38"
Norman was a native of Bermuda who was proud of his family. Richard owned a beautiful hotel in Bermuda. Shirley had a loving family full of strong women. A contemplative quilt about finding solace in the stars. 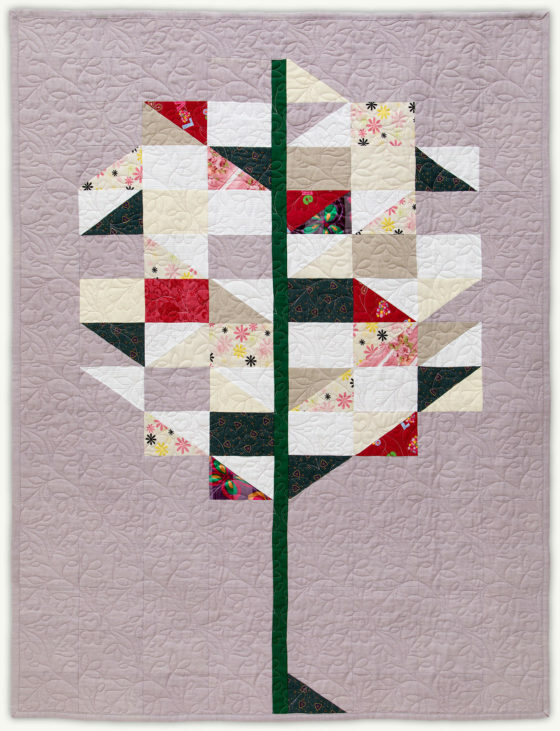 A sweet quilt showing the strength and comfort of a tree form. Marjorie had a great sense of humor and was one tough cookie. Eva was an exceptional artist and loved dressing for an occasion. Eva's closet was full of unexpected treasures. This quilt was made from the contents of a single shoebox which contained her collection of thin, silk scarves. 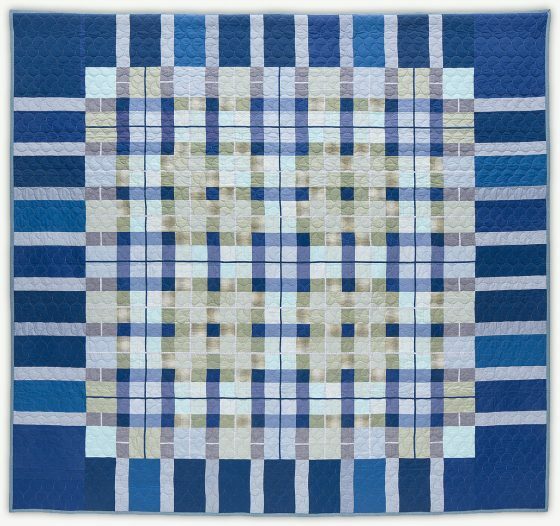 Quilt pattern: SMALL SQUARES. 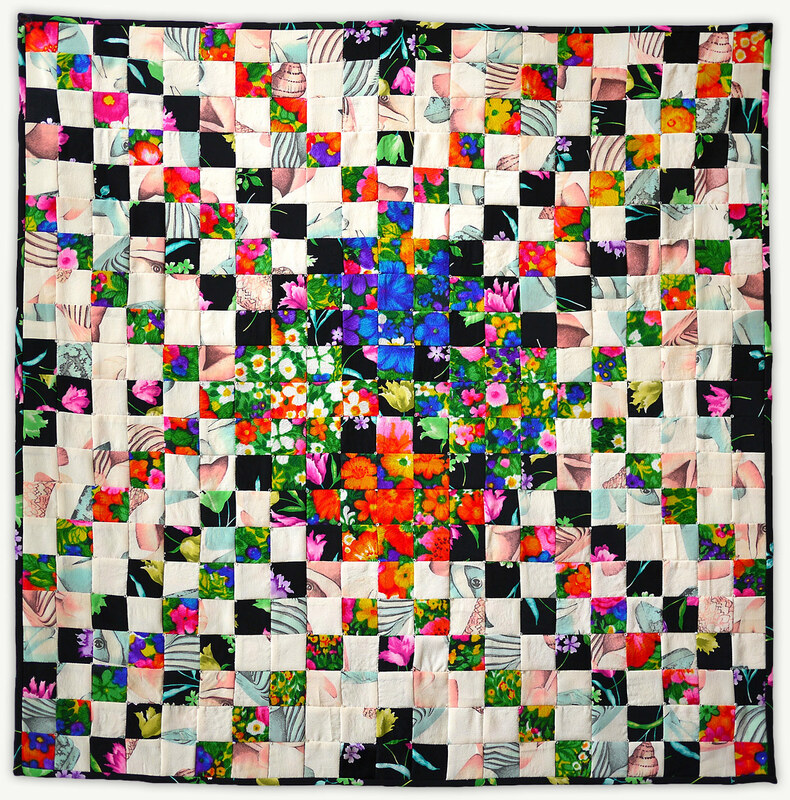 54"x76"
Eva loved tending her garden and making bouquets from her cut flowers. Barbara loved to paint was an accomplished watercolorist. This quilt is a reconstructed outfit worn by Diane at her wedding. Eva loved to shop and acquired an amazing collection of garments over the years. Ronny was known for his wry wit.